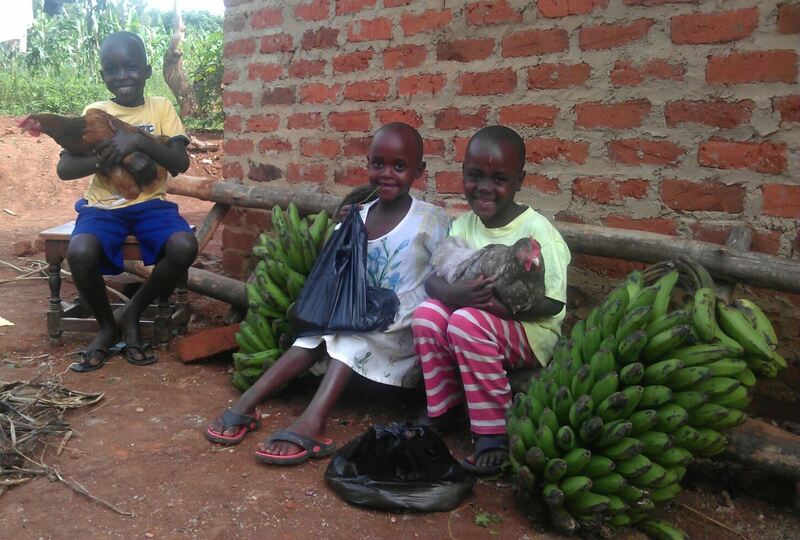 In Uganda the summer holidays are over and all the children have started school again. 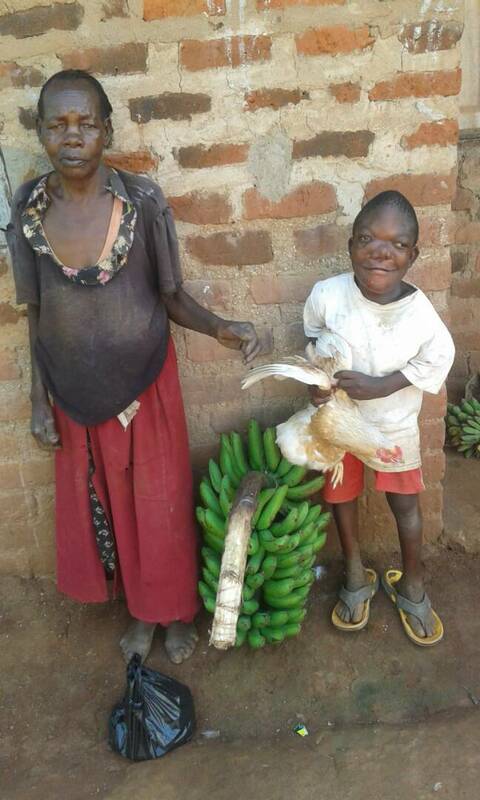 Only Yiga, a handicapped boy, is not able to attend school. He is eager to learn but can’t attend an ordinary school (yet). Because of his handicap and appearance he has been bullied and mistreated a lot in the past. He is very shy and tends to avoid people and responsibilities. Innocent teaches him arithmatic, reading and writing. He trusts her and enjoys the lessons. Who knows, maybe he will be able to go to school some time in the future. For children it is very important to be able to see well. 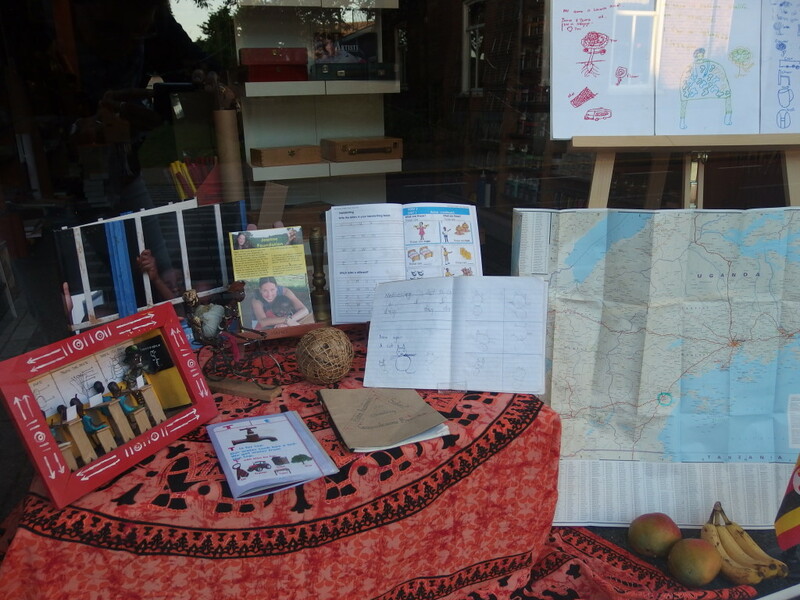 Especially for the children in Uganda as they have no schoolbooks and have to copy texts from the blackboard. If they can’t read the text on the blackboard well, they will copy the text incorrectly in their notebooks and consequently they will learn the mistakes they made due to bad eyesight. 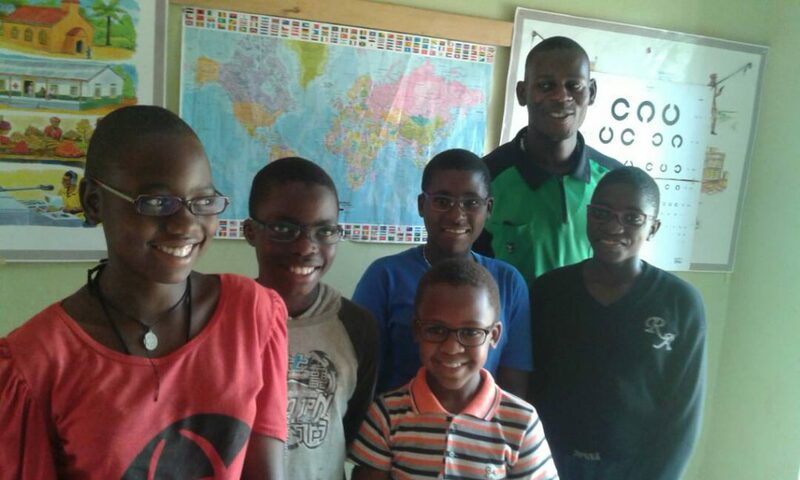 That’s why we are very happy that the first glasses have been delivered to the children by Michael. He did the eye measurements and passed on his findings to Optometrist Te Kiefte in Dinxperlo ( Holland). They prepared the glasses and sent them to Uganda. We are glad that our eyecare project seems to work well and that bad eyesight will nolonger have a bad influence on the education of some children. During the night of 22 August the students of Schaersvoorde stayed awake all night to collect money for two charities: Serious Request and the Joanne Foundation. 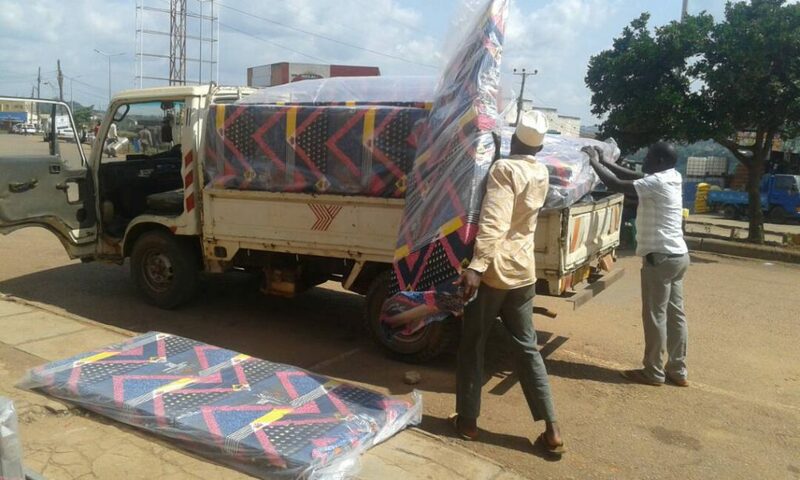 The Joanne Foundation intended to spend the money on buying mattresses and beddings for the needy people in Ndegeya. 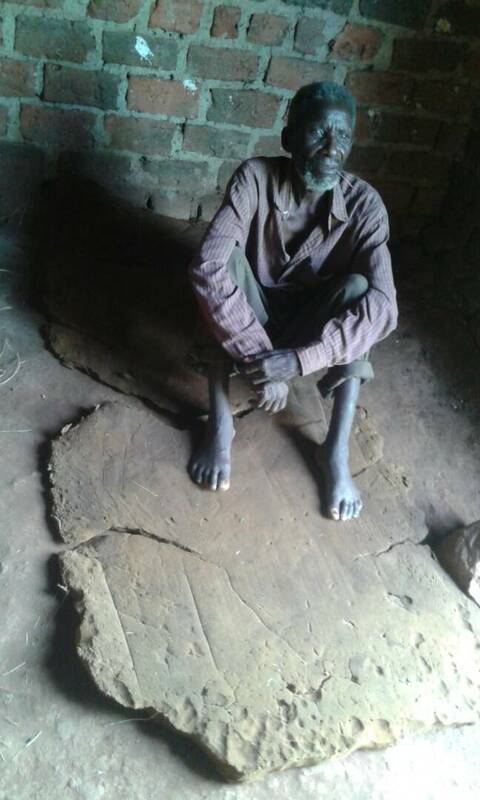 Apollo told us that there are many people in this village who sleep on the floor on a plastic sheet, a mat or a little bit of straw because they don’t have the funds to buy mattresses. 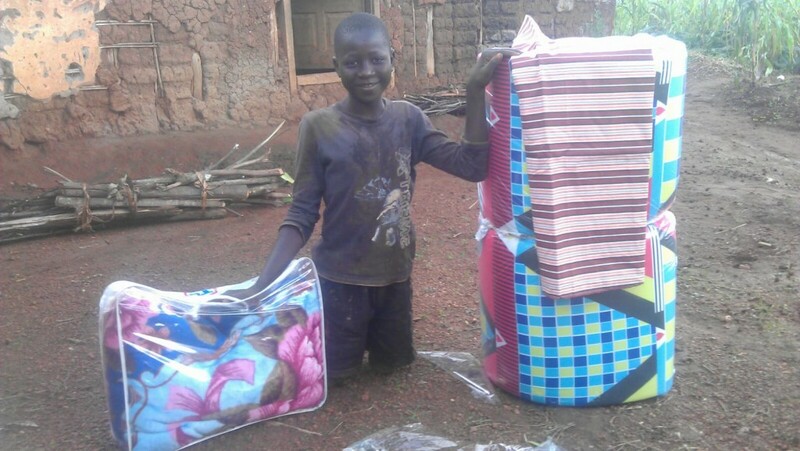 The students of Schaersvoorde collected 1700 euros and with this amount of money we could buy mattresses and beddings for 38 people. Logistically it was quite a job for Apollo to deliver the mattresses to the people but fortunately he has a friend who offered the use of his truck for free. 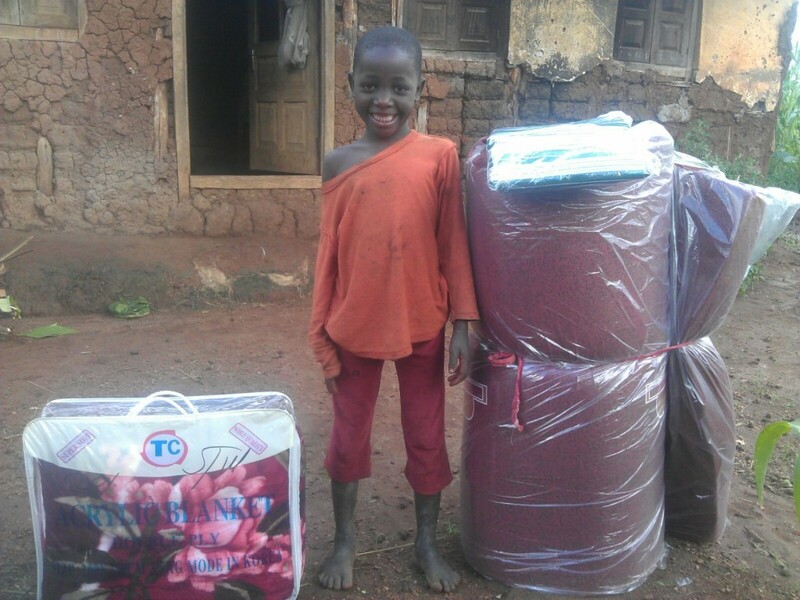 The people who received a mattress and beddings were very, very glad. For some it is the first time in their lives (!) that they are able to sleep on a mattress which is hard to imagine for us westerners. 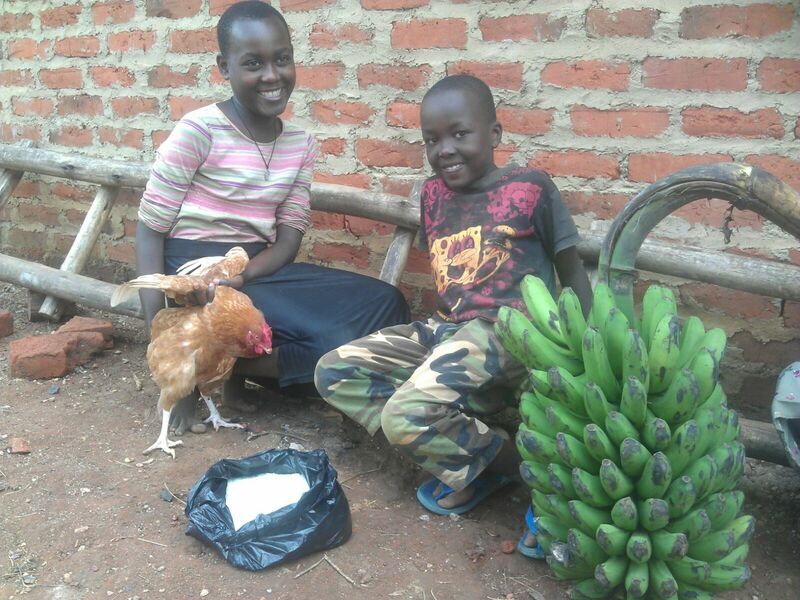 As we did last year, we asked Apollo to buy a Christmas food package consisting of a big chicken, 3 kg of rice and matoke (nutricious cooking bananas). Together with Apollo we selected 15 families who we thought could use an extra meal very well. We are so very glad with the financial contribution received from Mondiaalten which enabled us to have a waterpump installed on the property of a school for deaf children in Masaka. 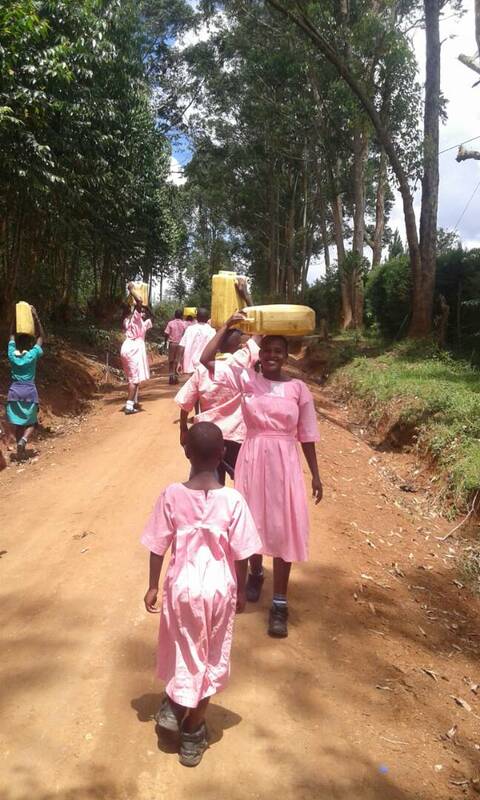 Daily the students had to walk along a busy road to collect the water and because they are deaf they don’t hear the approaching traffic. This created dangerous situations and near accidents. 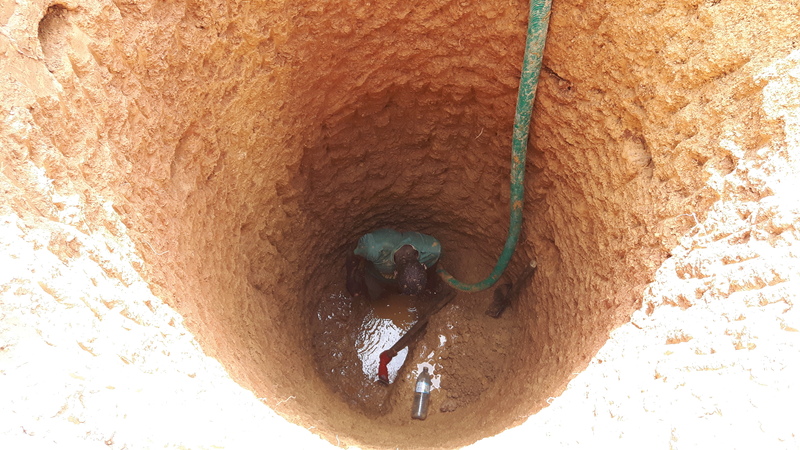 When the builder started digging the borehole it appeared to be more difficult than expected because they had to dig through rocky layers and the waterlevel was at 100 ft. To be certain that there is always water (also in the dry season) they dug 12 ft deeper. 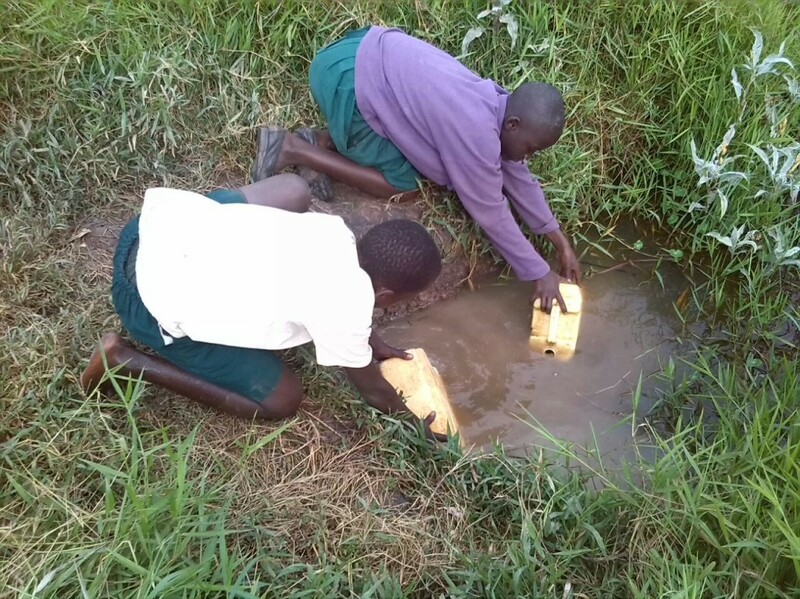 All in all it was a tough job but after 3 weeks it was done and the students now have clean water close to their school. The graduation party for students who pass from Nursery class to Primary school is a nice tradition in Uganda. 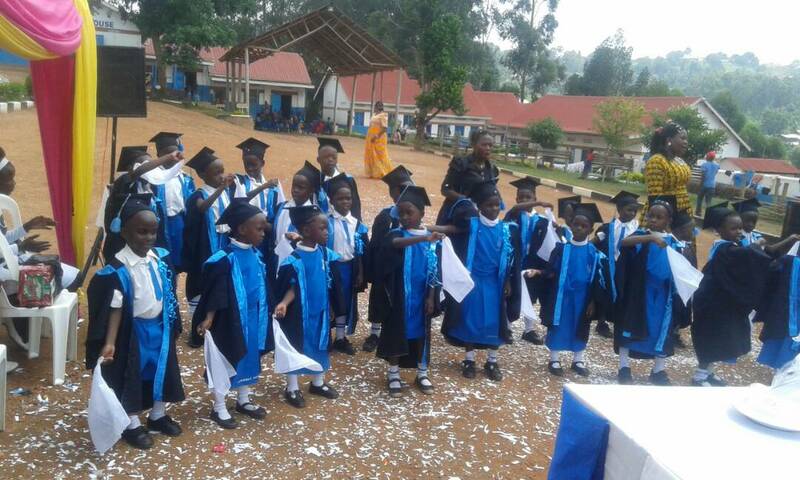 The children wear a robe and a mortar board and receive a certificate. We are proud of the wonderful reports of Ruben and especially Owen, the boy with Down syndrom. 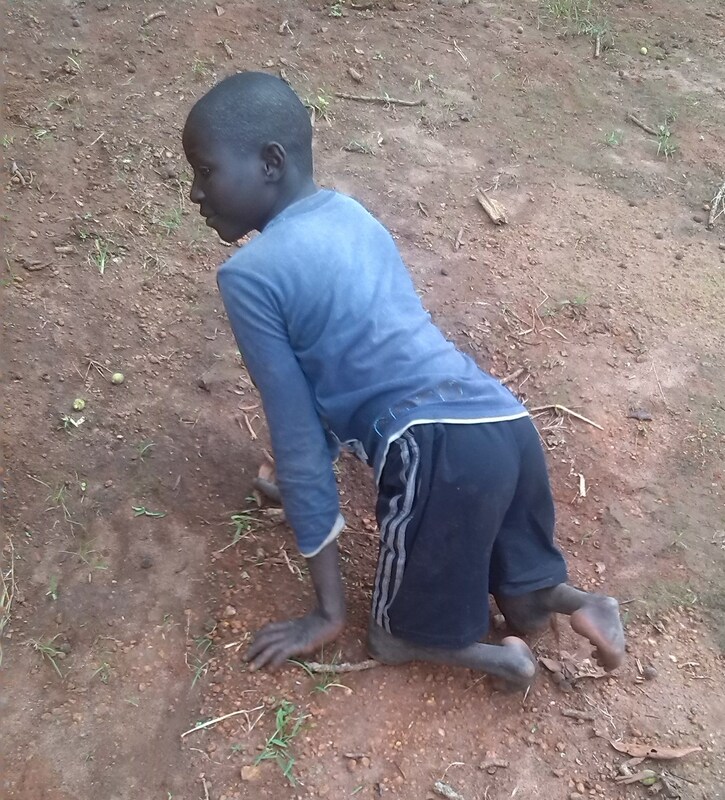 It is not normal for handicapped children to go to a primary school in Uganda. 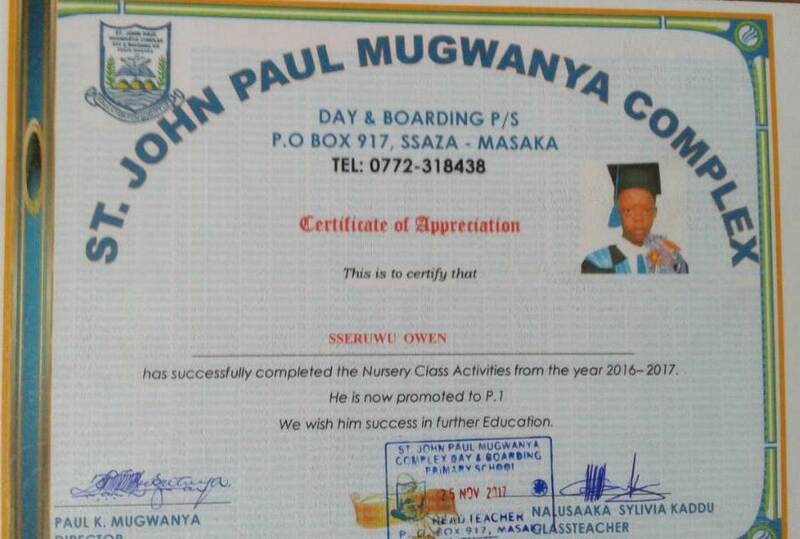 We are very happy that the St. John Paul Mugwanya School gives Owen the chance to get an education at this school. He enjoys going to school and has lots of fun with his classmates. 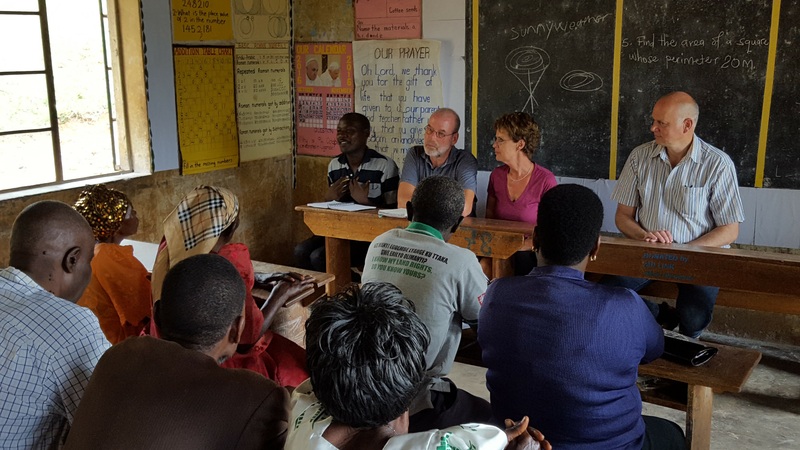 Our boardmember Helma Noordink visited Uganda from 10 till 24 October. 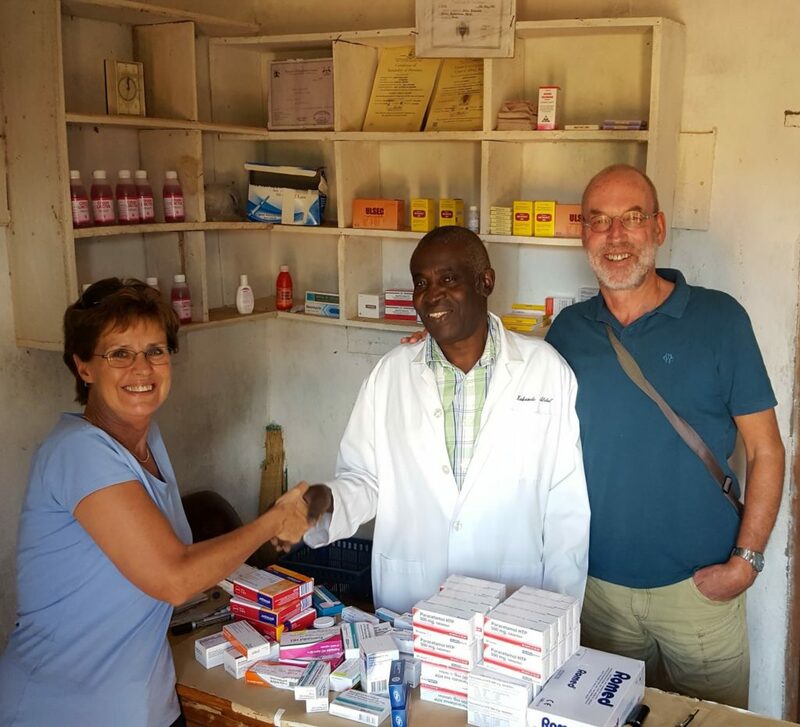 This time she was accompanied by Netty Flierman (nurse) and Derk Jan te Kiefte (optometrist) and his wife Christien. They visited all the children, the families, the schools and projects supported by the Joanne Foundation. 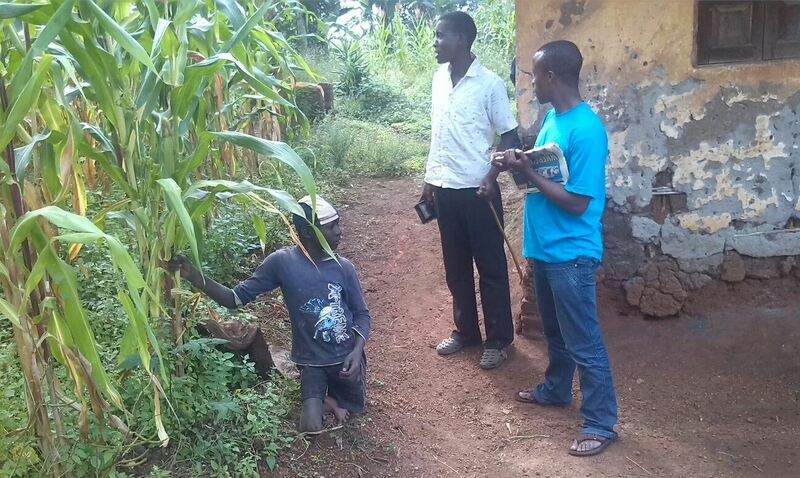 It was good to see that together we make a difference for the unprivileged people of the Ndegeya community in Uganda. 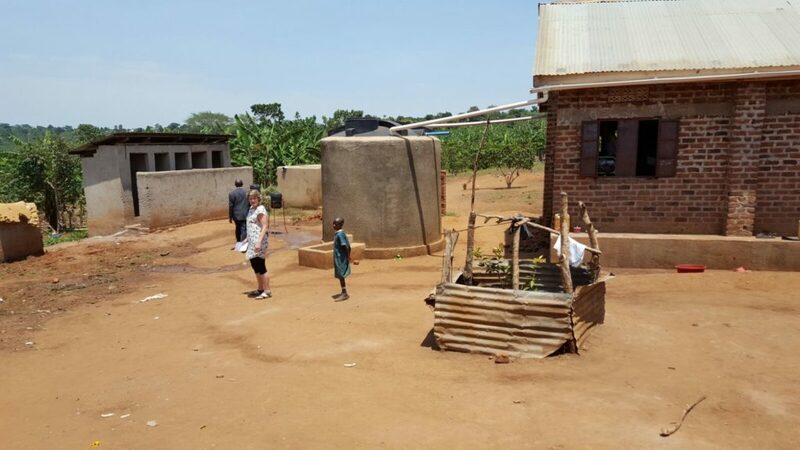 The eight waterpumps that the Joanne Foundation had installed this year function very well and they satisfy a great need. During their stay they started a smallscale eyecare project. 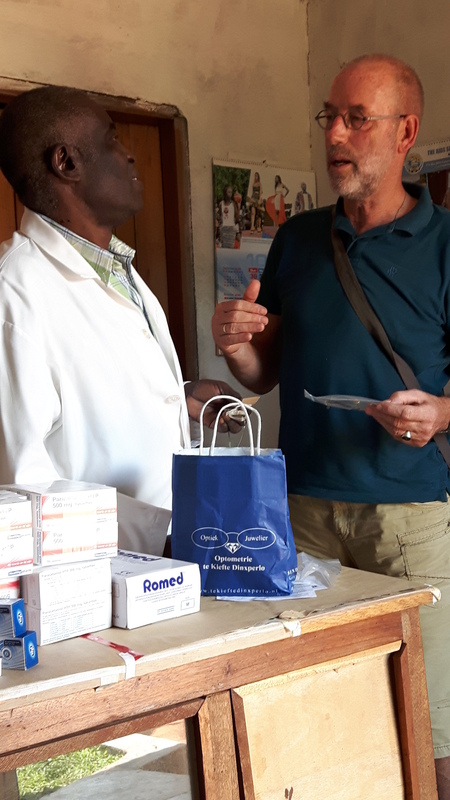 Derk Jan and Christien are closely involved and will support this project through Michael, a young man they trained in doing eye measurements. You can read their extensive report at Nieuwsbrief Joanne Foundation november 2017 (unfortunately it is only in Dutch). A few weeks ago Apollo met Yiga, a 15-year-old multiple handicapped boy with Down syndrome. 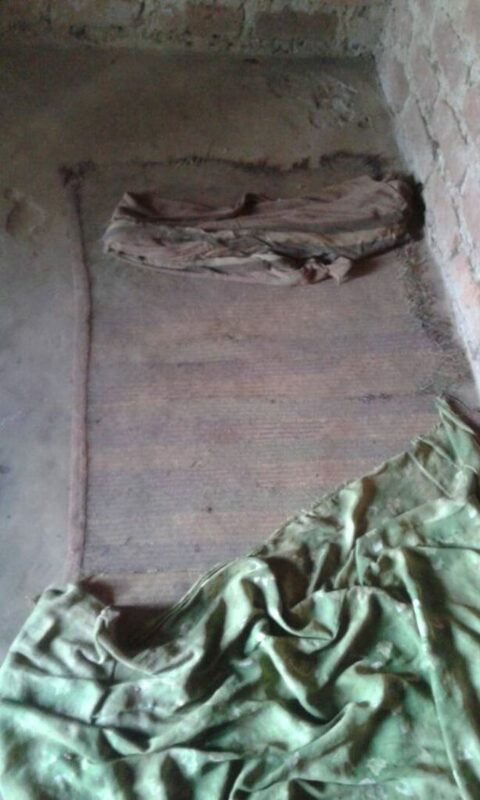 He lives with his 72-year-old grandmother under very primitive circumstances. He doesn’t know his father and his mother dropped him at his grandmother’s place when he was one and she left without a trace. Yiga has never been to school so he can’t read or write. 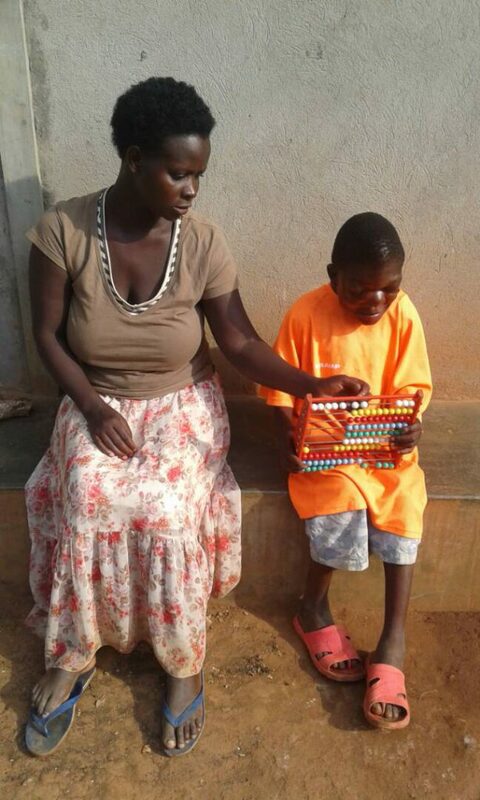 Recently he started visiting Joanne’s Library and Reading Club where Innocent reads with him and where he can play. Innocent always makes sure that Yiga leaves with a full stomach. 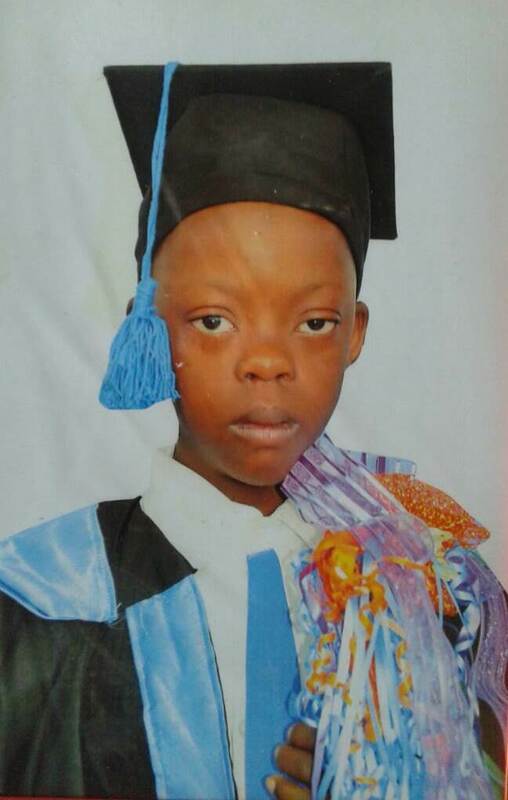 The Joanne Foundation will try and find sponsors to further help this boy and his grandmother. 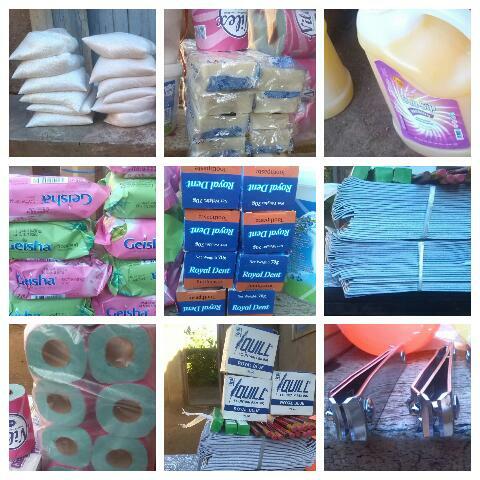 Because they slept on a piece of plasic we bought mattresses and blankets for them. Yiga had found some old clothing and slippers on a landfill so Apollo provided him with some new clothes and slippers. 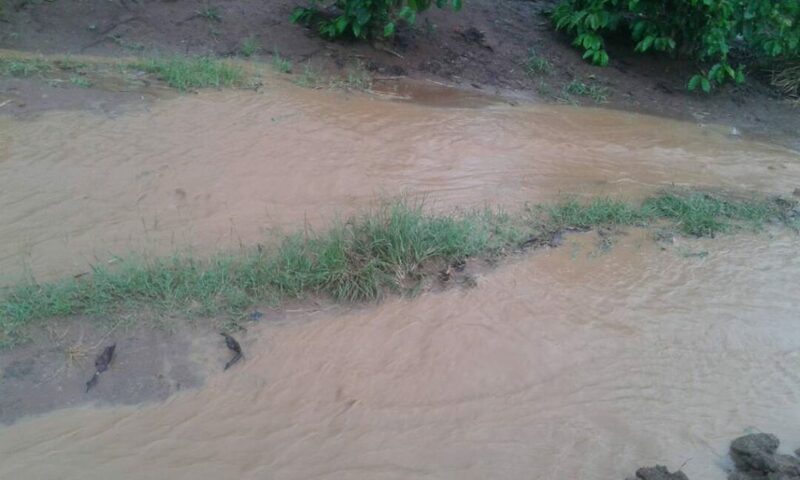 At the moment it is the rainy season in Uganda and this means that it often rains very heavily with the result that roads are flooded and impassable and villages can’t often be reached. Mateete, the village where Jovia lives and where the Little Stars school is located, is difficult to reach at the moment due to the heavy rains. 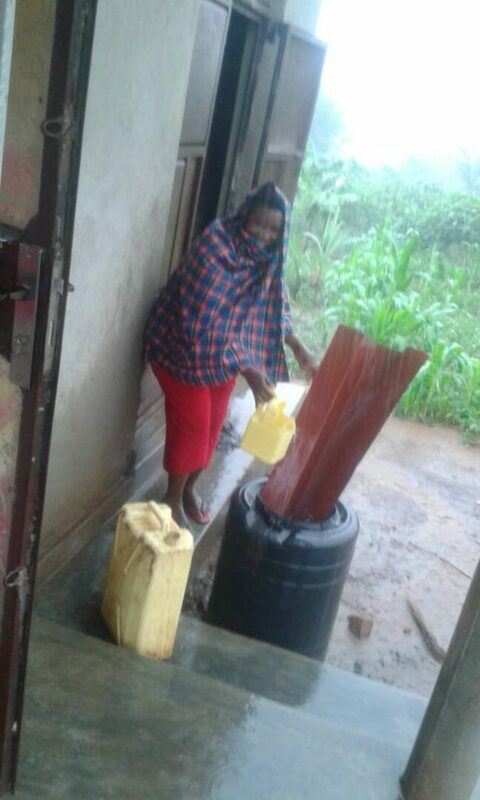 Jovia tries to collect rainwater in order to have clean drinking water by improvising a sort of funnel. 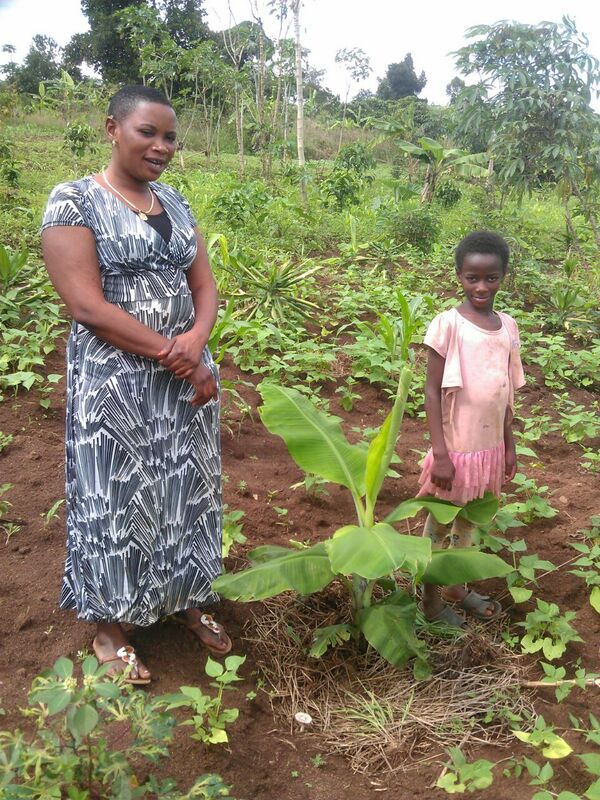 We intend to install gutters and a big watertank to supply Jovia, and her neighbours, with sufficient clean water for a longer period. At the end of July the PeGeWe will organize the Winterswijk-fourday-bicycletour and we are happy that part of the proceeds is meant for the Joanne Foundation. This will help us pay for the installation of the gutters and watertank. 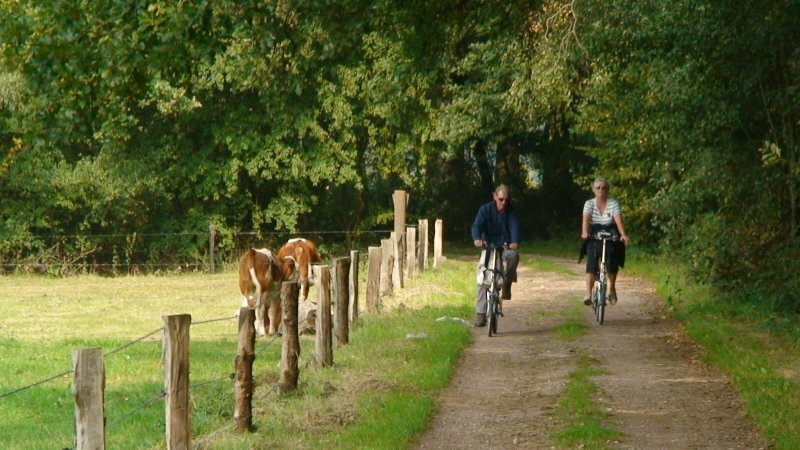 Fancy a wonderful bikeride through the beautiful surroundings of Markelo and delicious snacks on the way? Lionsclub Markelo-Lochem mixed, together with MarkeLokaal, organize a “taste&ride” tour on Sunday 21 May 2017. What is really nice about it… that the proceeds are meant for the Joanne Foundation! Some time ago we told you about Hanifah the blind woman and her children. 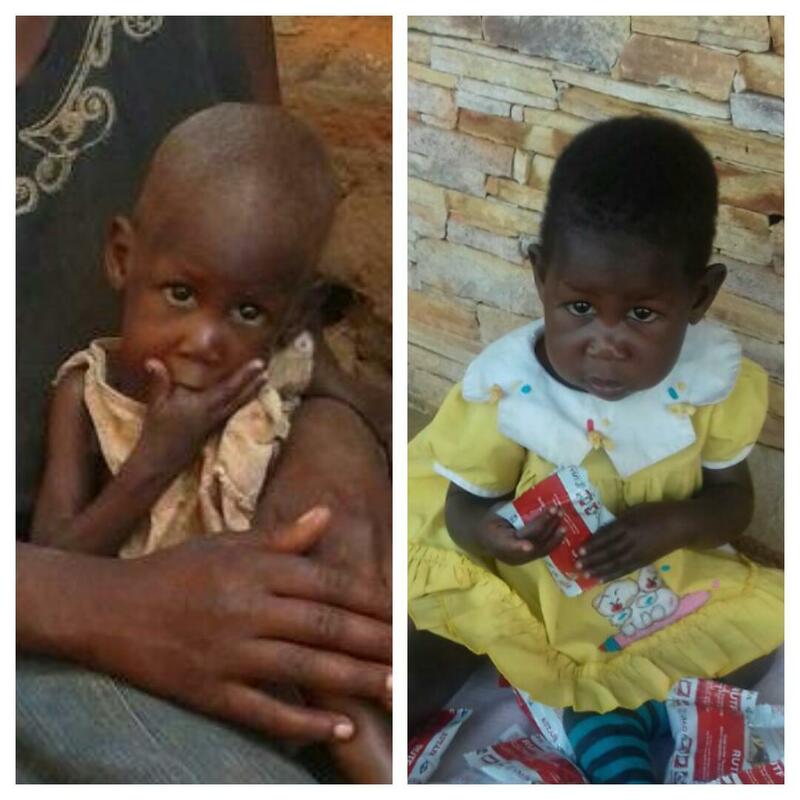 In spite of the worries we still have about this family, there is also some good news to tell: as you know Rehema was seriously undernourished but the last three months she has been given RUTF (Ready to Use Therapeutic Food). Yesterday Jane took Hanifah and Rehema to hospital and it appears that Rehema has gained weight. 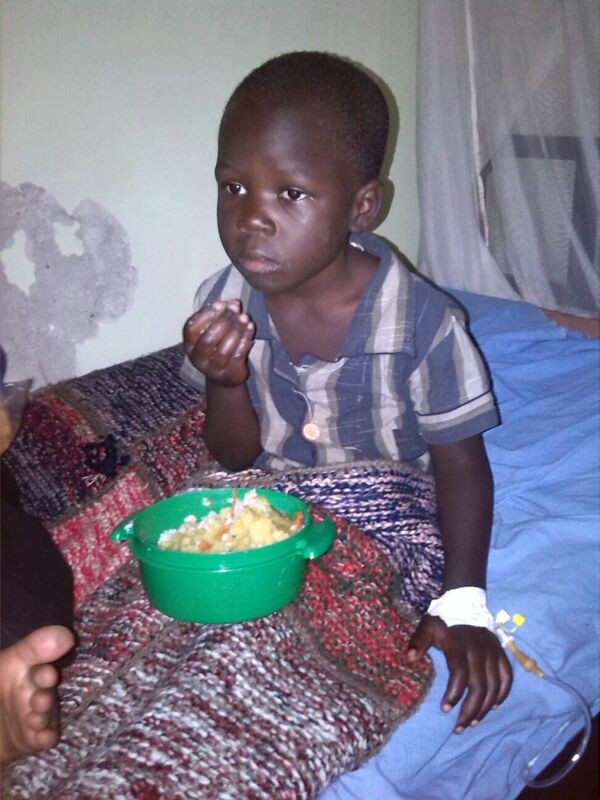 Since a few weeks Rayan attends school so he is assured of one meal a day. Hanifah has been given some medication to help her with her epilepsy. Although we have not found a solution for the distressing situation of this famiily, we are very glad that they are improving. 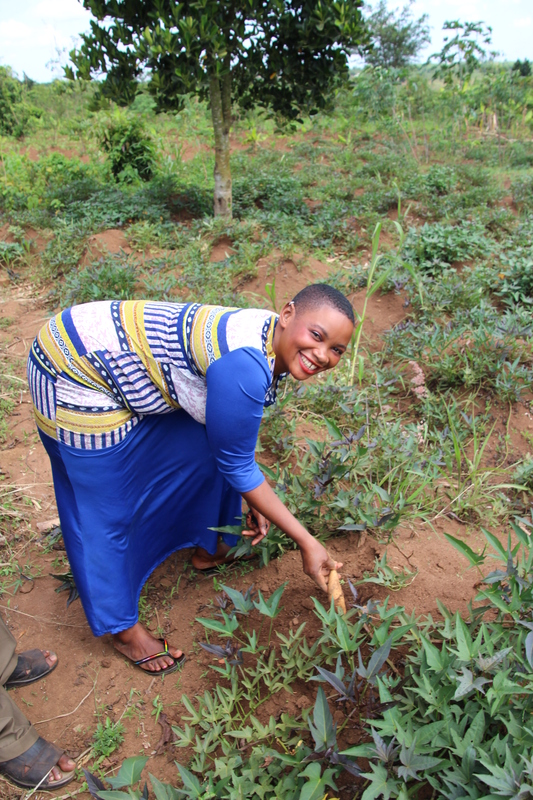 Rehema in December and in March….. 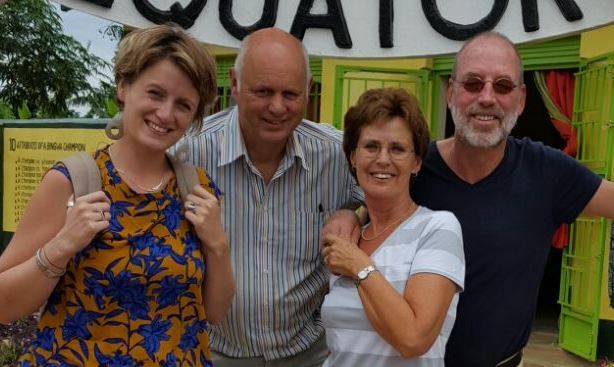 Together with her husband Jacques, our boardmember Anja visited Uganda in February. 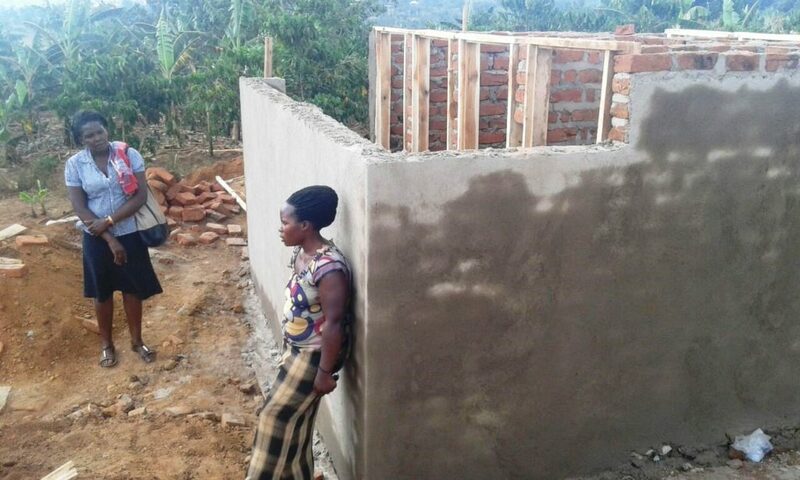 She visited the families, the schools, the new latrines and the waterpumps and she also joined nurse Kakande on his rounds through Ndegeya. On 21 February Twetise Grace delivered a healthy babyboy called Bennett. The delivery was a little bit problematic so Bennett was born with a cesarean. Mother and child are doing fine and the father is very happy with his son. 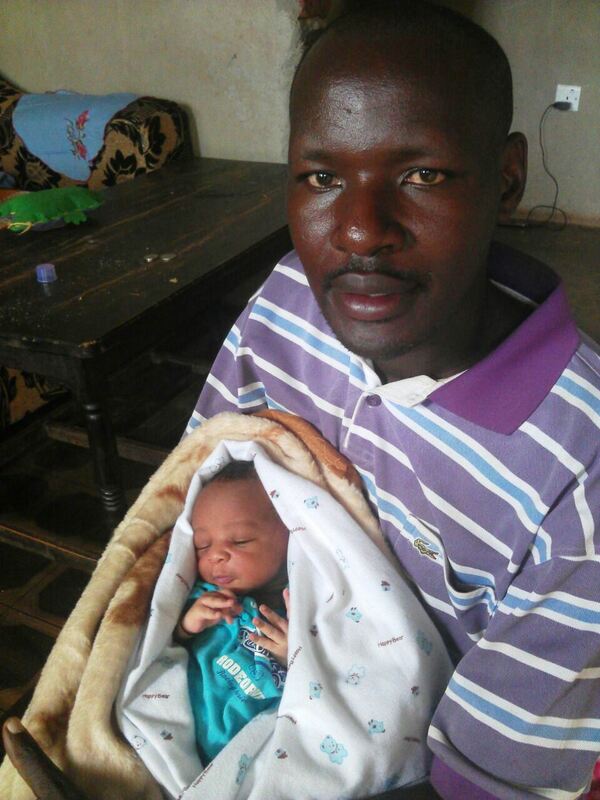 On 14 March Betty, the wife of our driver Namallah Henry, has delivered a healthy daughter called Heather. Last year the health inspector threatened to close down the Little Stars School if the old latrines were not closed and new ones built. There weren’t enough latrines (only five voor more than 600 students), there were full and they were situated too close to the watertank and dormitories. 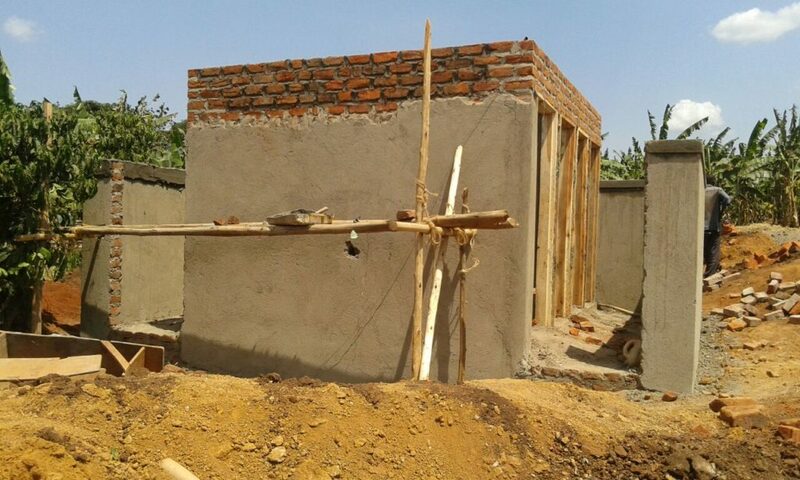 We have good news because thanks to various sponsors and the vmbo department of Schaersvoorde the school needn’t be closed because 16 new latrines are being installed at the right spot. Two deep holes (60 ft deep!) 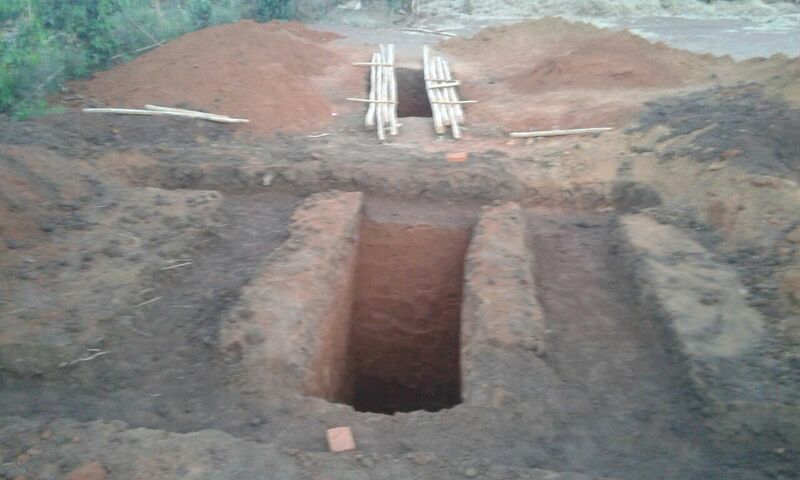 have been dug and 2 buildings of 8 latrines each are being built over the holes. The builder told us that the work will be finished before the end of the holidays when the new term will start. We are so happy that the education for the children in this remote area will continue. 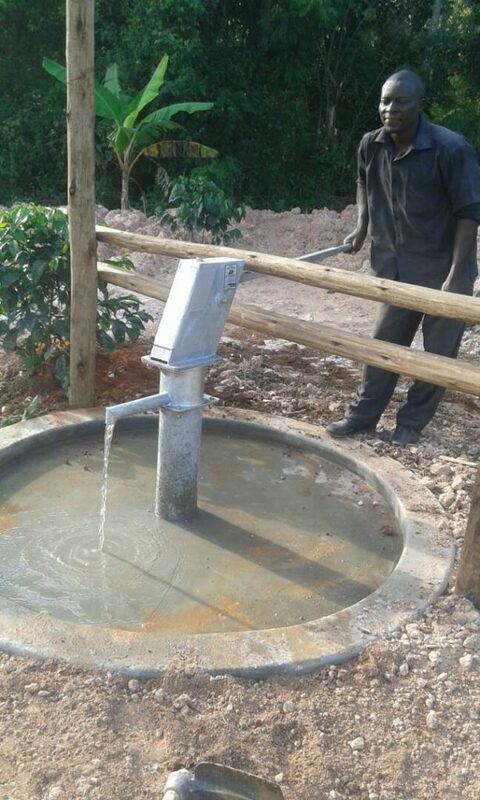 We are happy to be able to tell you that up till now 5 waterpumps have been installed in and around Ndegeya. The construction of pump number 6 will start this week. An important part of our project is to instruct the people about the importance of using clean water for their health. 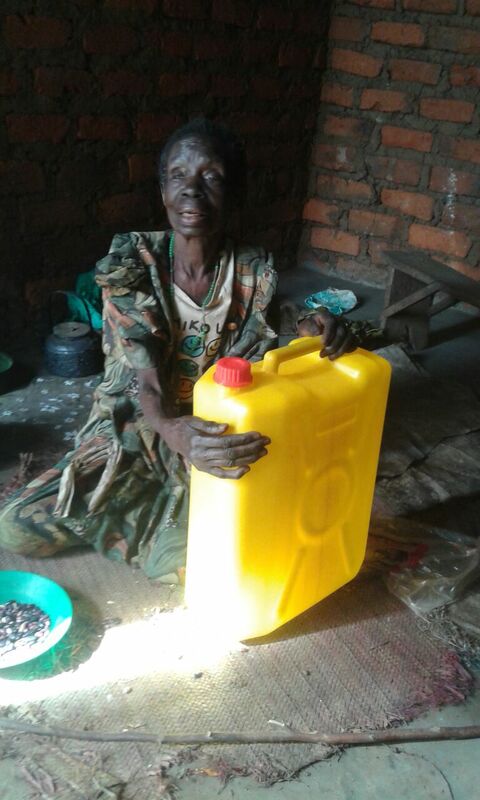 The Joanne Foundation has provided the community with 50 jerrycans. 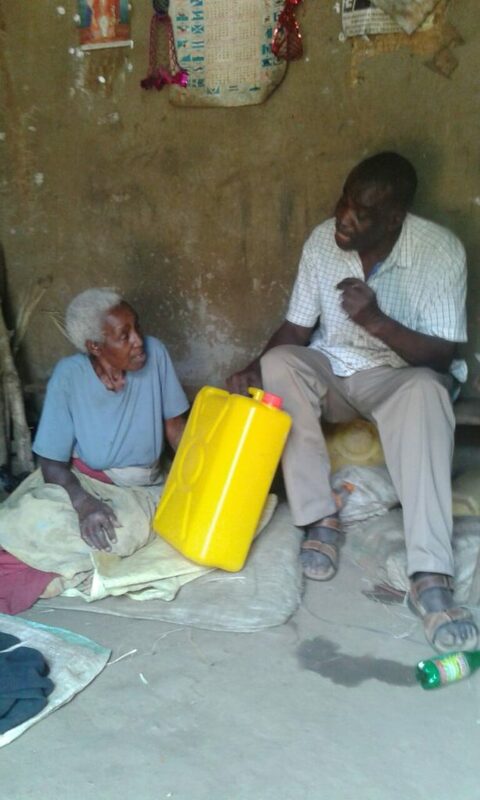 Nurse Kakande has given the jerrycans to the people and explained that these jerrycans should only be used for clean water. In doing this we hope to help prevent diseases. 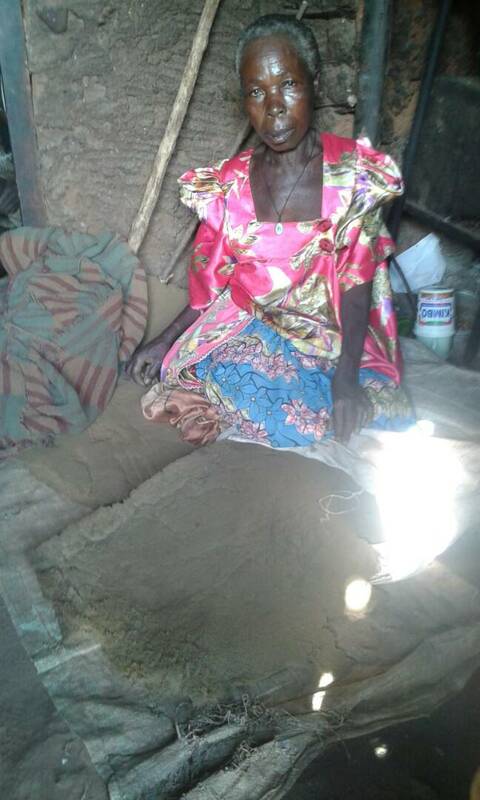 Hanifa is a blind, single mother and is hardly capable of looking after her two children. Her son Rayan is eight years old and her daughter Rehama is two. 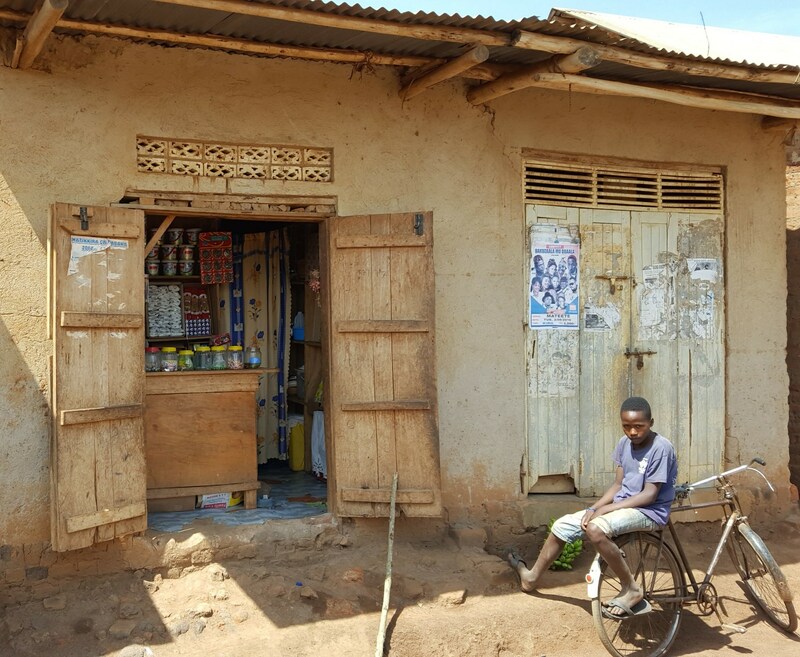 Hanifa’s mother is a big help and she was able to support her blind daughter and grandchildren from the proceeds of her shop. But because of the fact that she became ill she had to close her shop and all her money was needed for her medication and doctor’s bills. She couldn’t look after Hanifa and her children anymore. 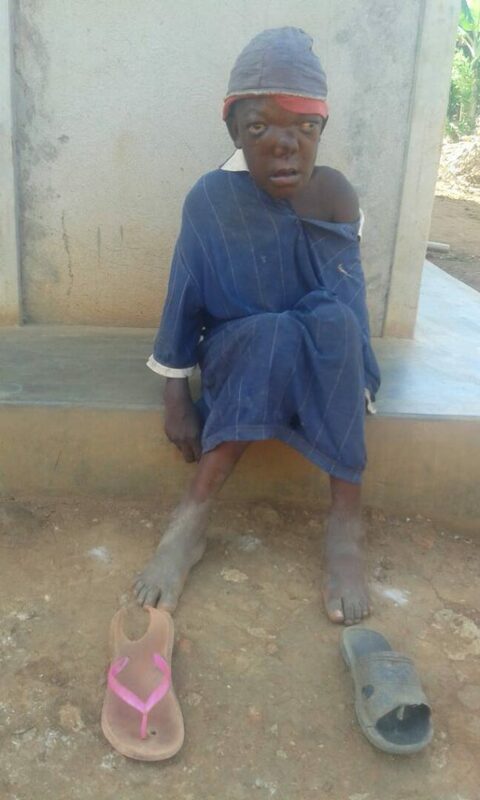 At the moment the situation is heartbreaking, both children are seriously underfed and Rehama has a growth and development retardation. We would really like to help this family. 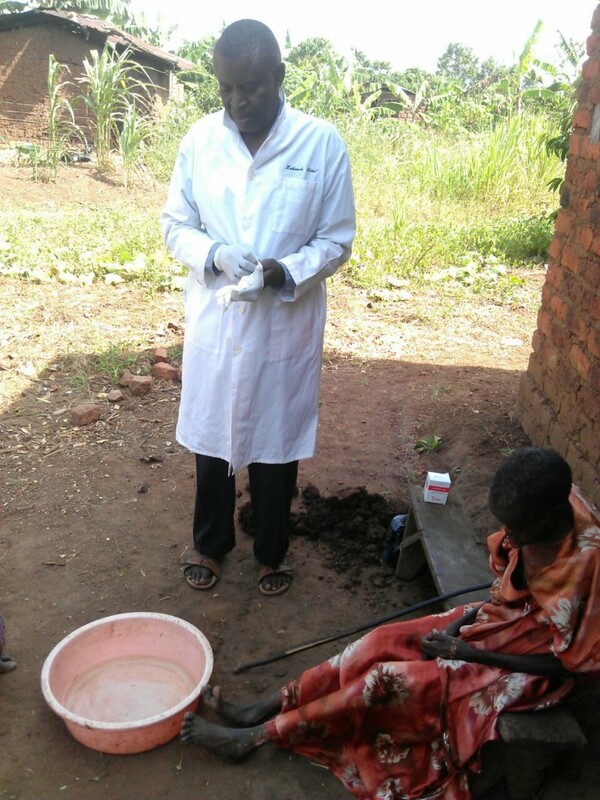 Nurse Kakande has examined both children and the grandmother. We will start by giving them some good food and we hope to help grandmother to set up a shop again sothat she will be able to look after her daughter and grand children. 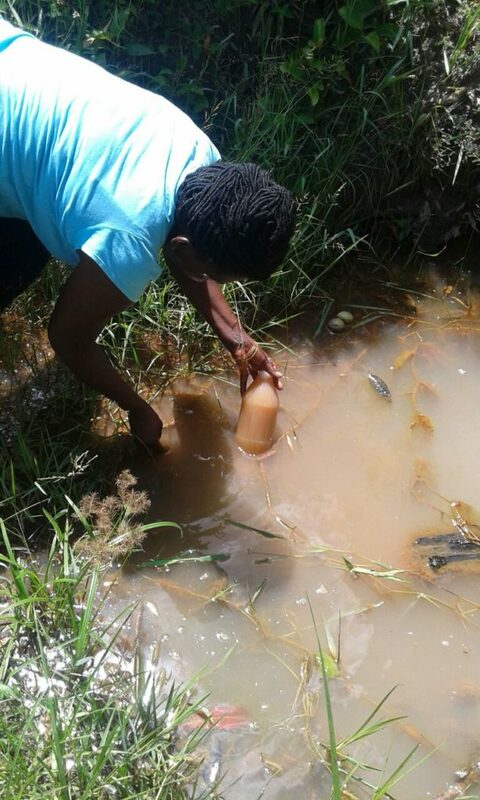 So far the Ndegeya community depended on their watersupply from nearby marshes containing polluted water. 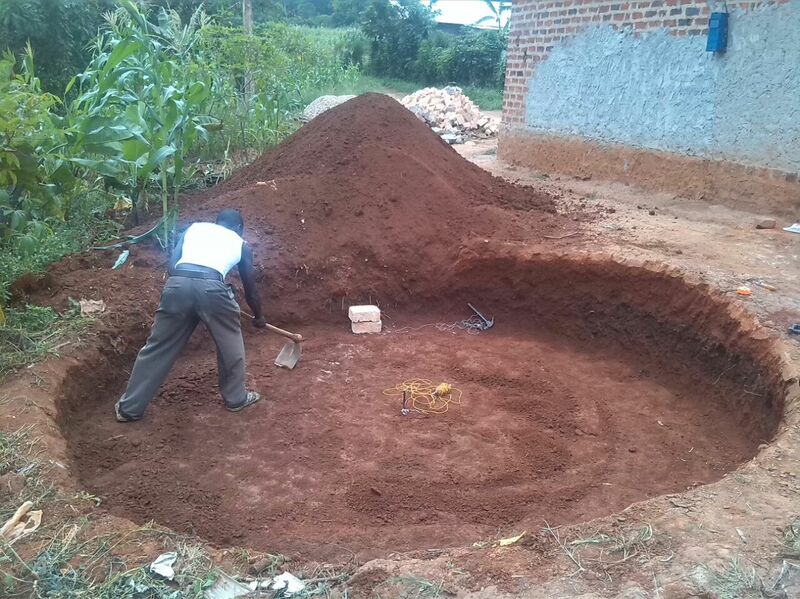 With the help of sponsors we are now working on having waterpumps installed in Ndegeya and the surrounding 7 hamlets. 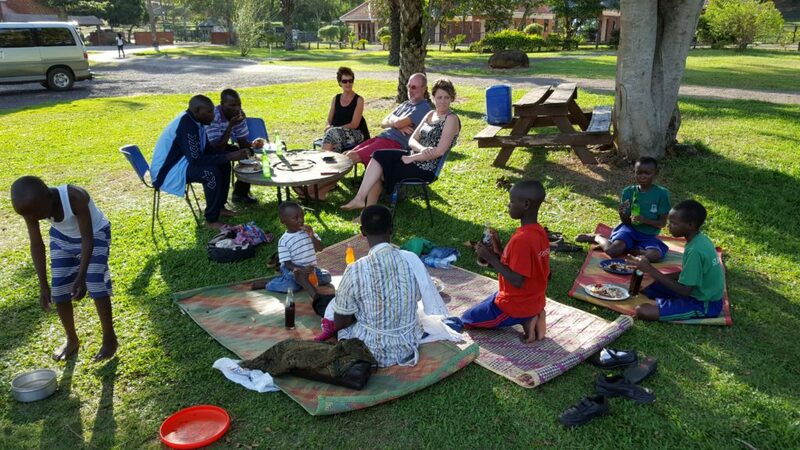 In October 2016 we (Arent and Helma) visited Uganda again. Together with our friends Brecht and Arjen we visited the families, the schools and projects. Brecht and Arjen posted a message on Facebook frequently. Below you’ll find these posts. We always meet Phionah on our first day because she lives and studies in Kampala. It was wonderful to see that she was doing fine. 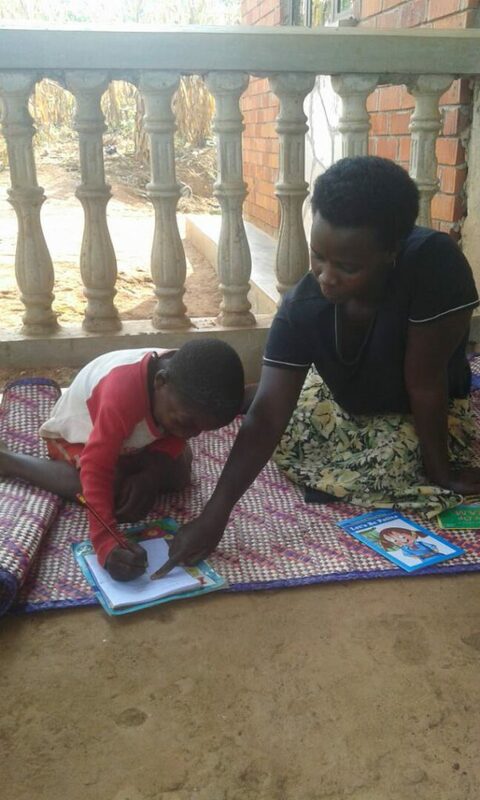 Her working days are long ones, in the mornings she works as an assistant at a school, in the afternoons she has her own studies to become a primary school teacher and in the evenings she has to do her homework. 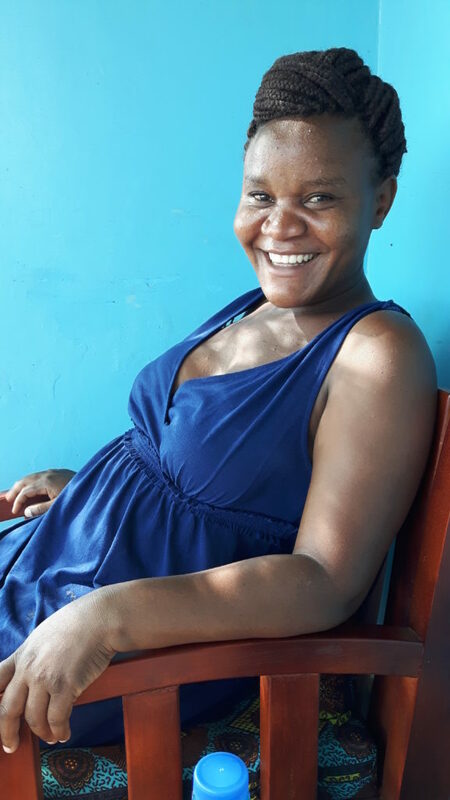 She enjoys he work very much and she is looking forward to finishing her studies next year so that she can work as a fully qualified teacher. 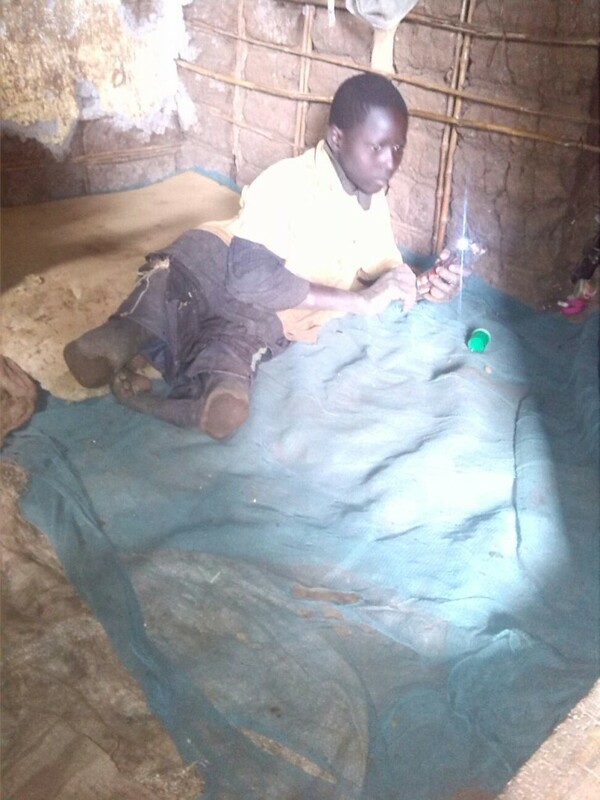 Kakande is a nurse. 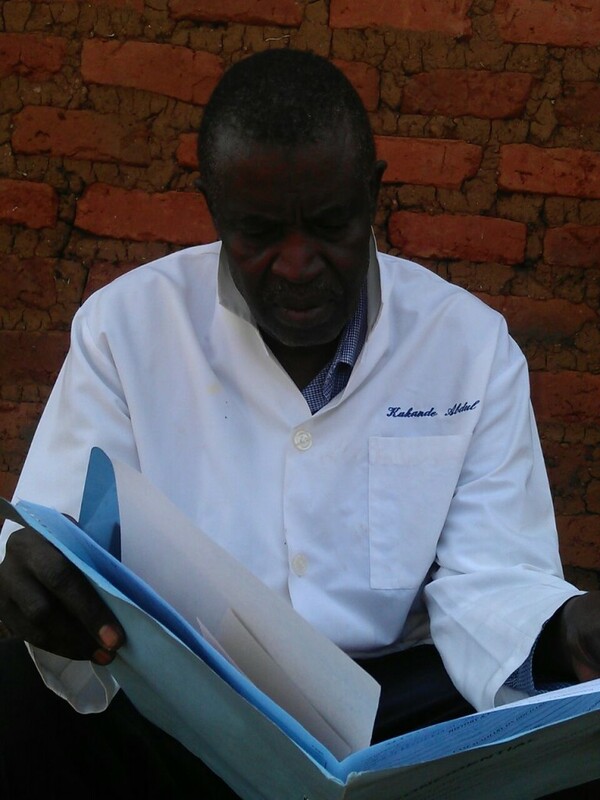 For years he has worked to prevent HIV and together with some other people he founded TASO. He is older now and has retired to his own district Ndegeya. Next to his house he has a small room which he uses to provide the sick and elderly people with medicine and advice. He also visits those chronically elderly people who are not able to go to his place. 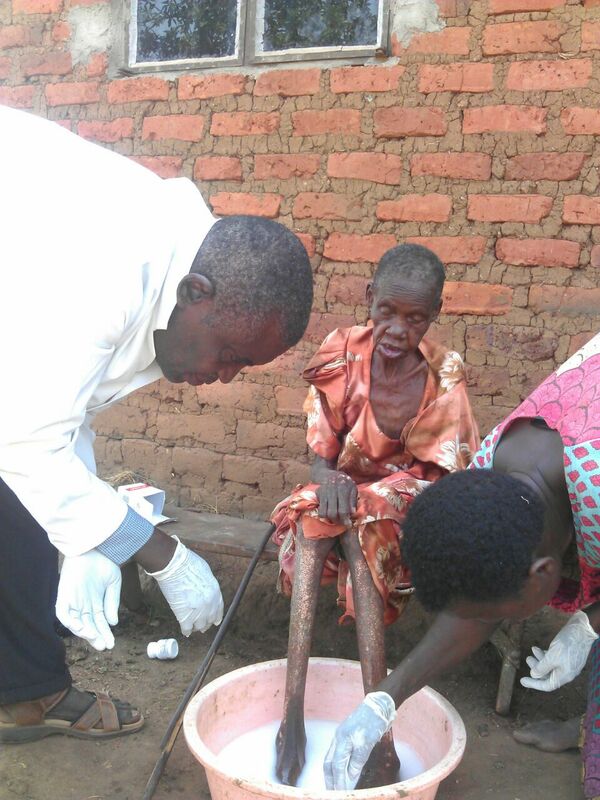 The Joanne Foundation provided Kakande with a lot of medicine, generously sponsored by our chemist and drugstore. Our neighbour who is an optician has given us glasses which we gave to nurse Kakande. In the near future we will probably also pay attention to eyecare in Ndegeya. 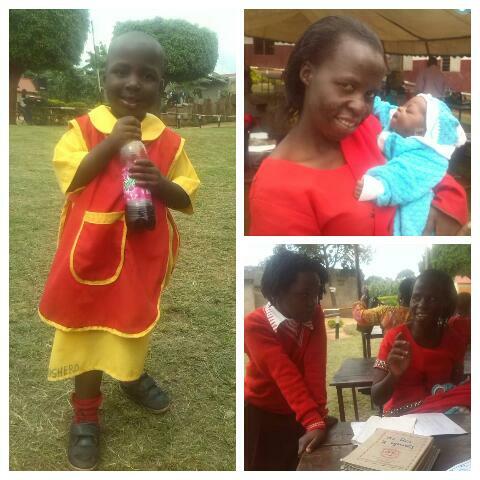 In 2007 Jovia worked at the Jireh Children Centre near Masaka. Here she met Joanne and they became very good friends. She named her daughter after Joanne: Miracle Joanne. 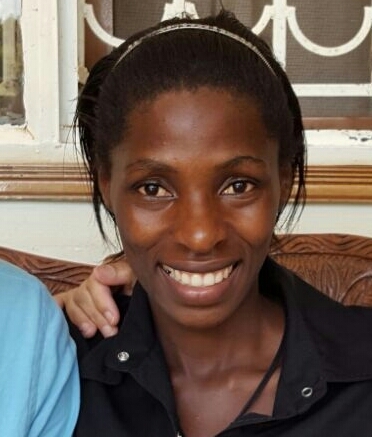 It soon became apparent that Miracle suffered from HIV and thanks to Joanne’s help she is still alive and kicking. Due to domestic violence Jovia had to leave her house. The Joanne Foundation has rented a small house for her inwhich she could also set up a shop. 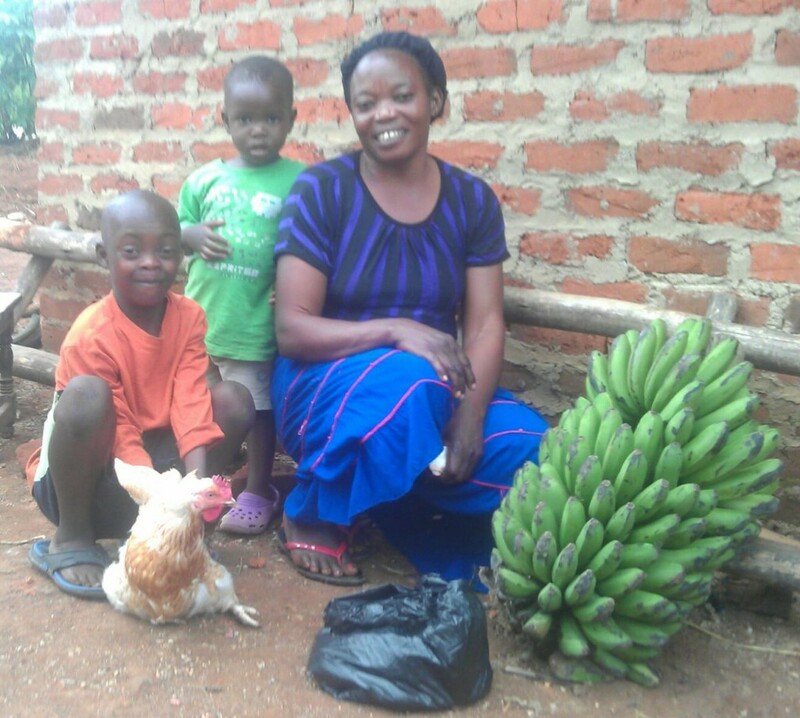 The shop enabled her to save some money and she used her savings to buy a piece of land to grow her own vegetables. We decided to give her a house of her own, bigger than the one she lives in at the moment so that the children don’t have to sleep under the counter due to lack of space. To make her less dependable on the weather we will also buy her some pigs and have a pigsty built. She was so very happy when we told her of our plans. She should be able to take care of herself and her children from now on. 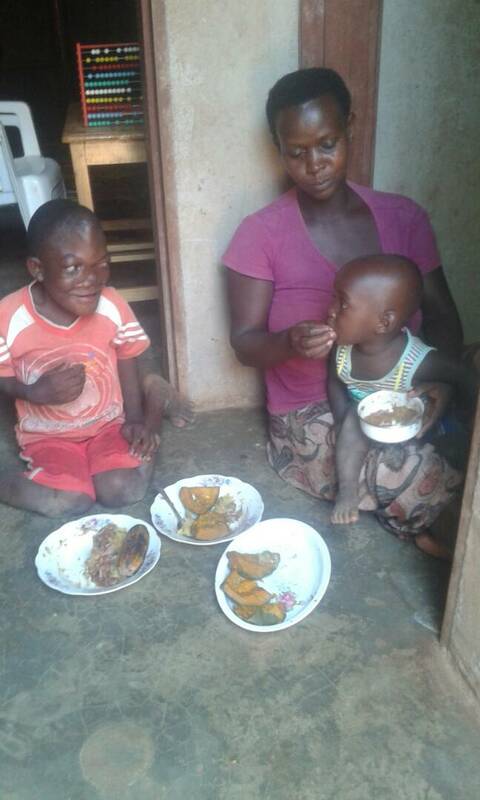 Children with Down syndrome are not always welcome in Ugandan families. Parents feel ashamed and they often think that the family is cursed. Owen is a Downer. He was kept hidden for 6 years. Two years ago Apollo saw him and talked to his parents asking them to allow Owen to come to Joanne’s Library & Reading Club. 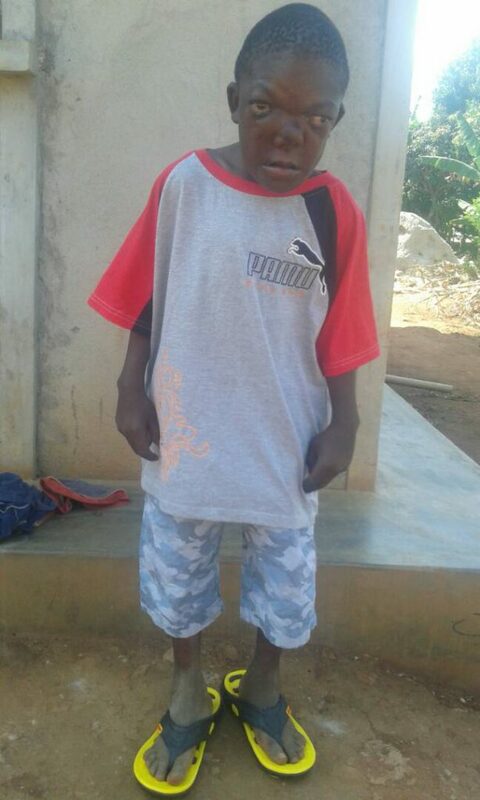 He started as a very shy boy who was not used to play with other children but soon he developped into a nice boy. The other children found out that children with Down are not crazy or cursed but that they are nice children. 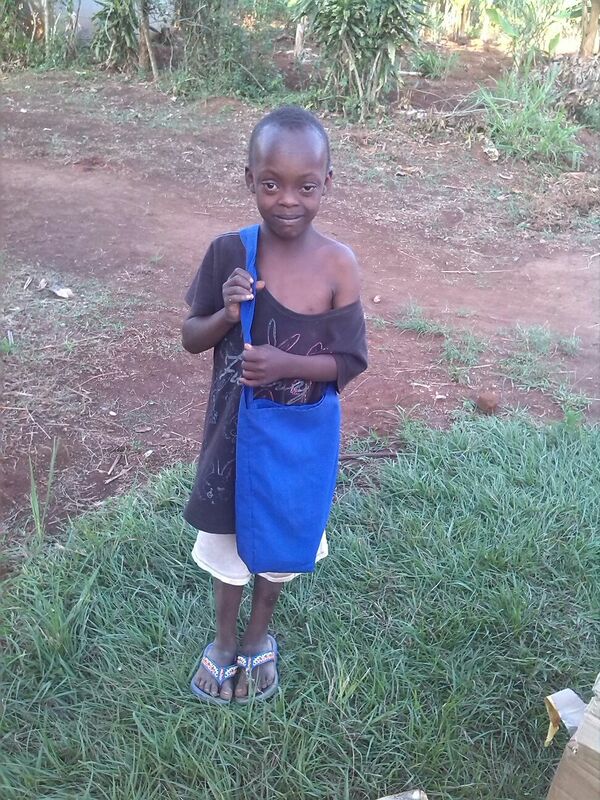 Thanks to sponsors Owen is now going to school and is doing very well there. Together with Apollo’s family we took him to Lake Nabugabo for a day out. It was obvious that he enjoyed the outing immensely. Ndegeya is the district where Joanne used to work and live in 2006/2007 and where Apollo lives. It consists of 7 hamlets. The Joanne Foundation has started a health program and a waterprogram in this district. The success of both programs in the long run depends on whether we are able to connect with the local community. Sunday was a very important day. Apollo had asked the village leaders of the seven hamlets to come together to have a talk with Helma and Arent. Also the owner of the property on which the waterpump will be installed and some other important members of the community were invited to be present at this meaningful and formal meeting. The purpose of this meeting was to connect with the community and ask for their coorperation. 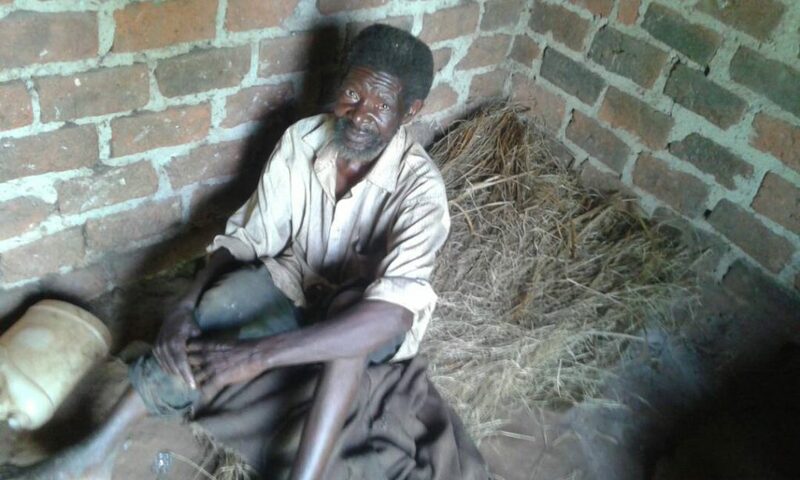 Coorperation with our healthprogram so that the people of the community will alert nurse Kakande if they know of elderly people who are ill.
Coorperation with our waterprogram so that the people of the community will take full responsibily for the correct usage of the pump. The meeting went very well. Arent spoke on behalf of the Joanne Foundation explaining why we are looking for coorperation and the people present all showed their appreciation for the work the Joanne Foundation is doing for their community and for asking their coorperation. We are certain that this meeting will be a big support for the succes of our health program and water program. We had a very good conversation with Bakka Godfrey who is going to install the waterpump for us. Together with Apollo he thought of a way to make the community feel that they own the pump. 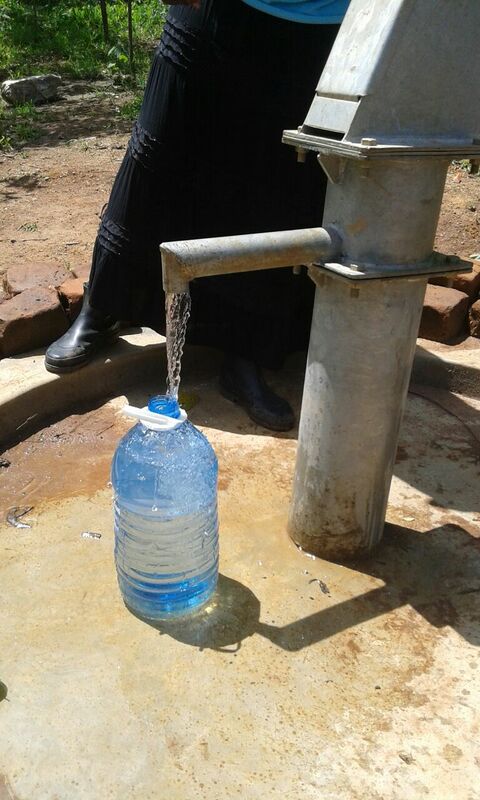 All the people of the community will have to pay 500 sh (13 cents) a month for the use of the pump. With the money the pump will be serviced regularly. This will hopefully prevent the people from using the pump carelessly. The pump should still be in operation 15 years from now! 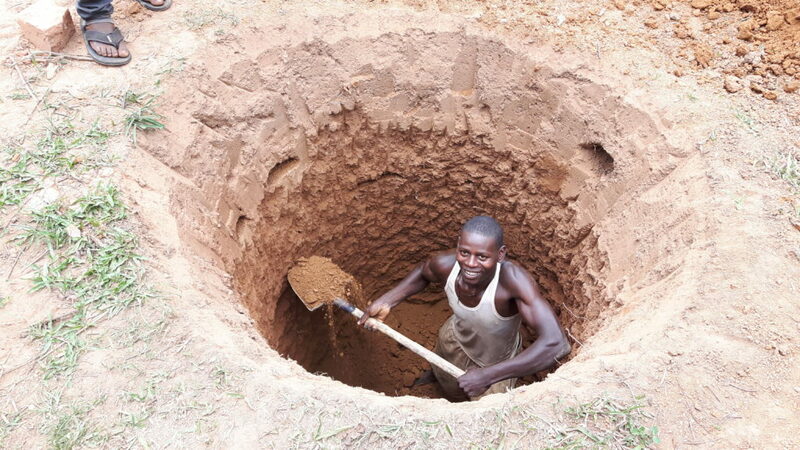 Digging started on Saturday and on Tuesday the well was almost completed. 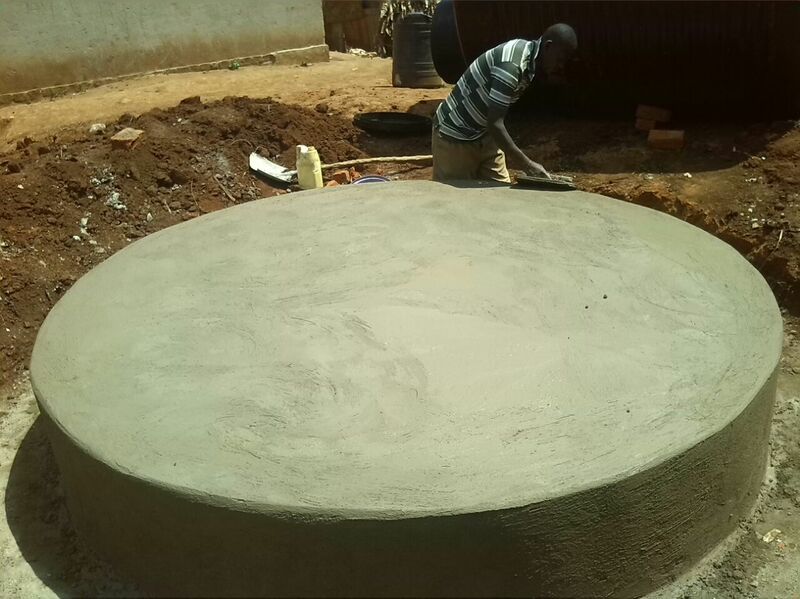 The concrete needed to harden for a few days and on Monday the final piece of the waterpump was installed. 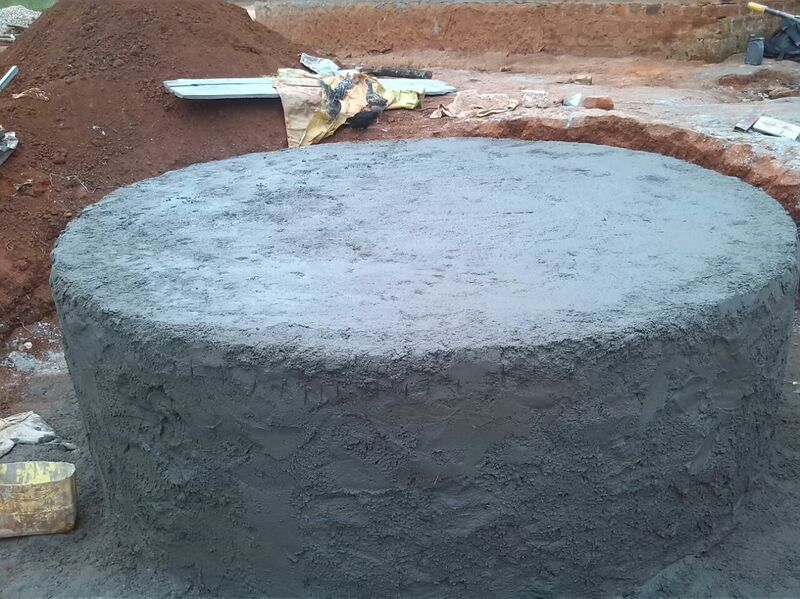 We are very pleased with the speed inwhich the complete well was installed and also about the cost. 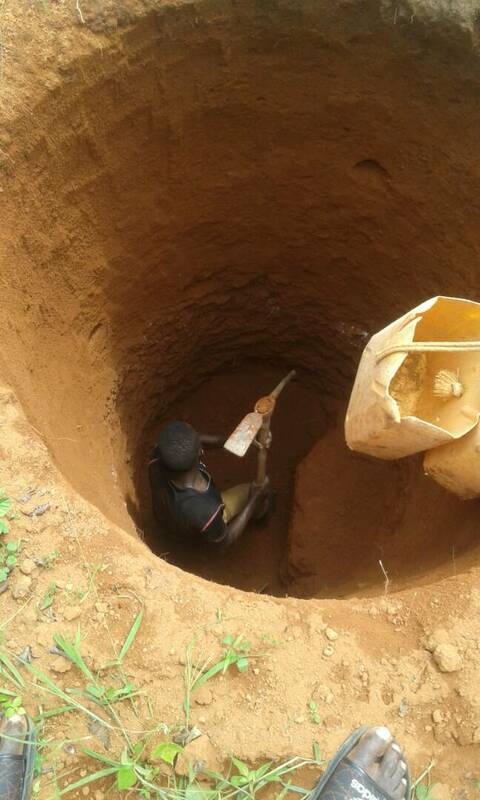 This kind of well is called a handdug shallow well and they are less expensive than bore holes. 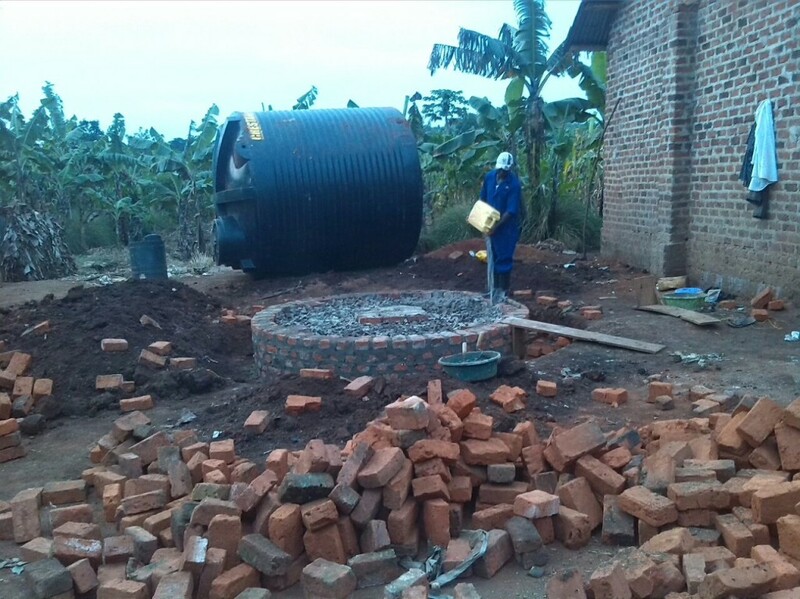 Thanks to recent donations the Joanne Foundation has enough money to have three waterpumps installed in the Ndegeya district and if we succeed in finding another € 6000 we will be able to provide the whole of the community with sufficient clean water. Joanne’s Library consisted of nothing more than a bookcase in Apollo’s livingroom. Now it is a room in Apollo’s house and it includes a second bookcase and benches. 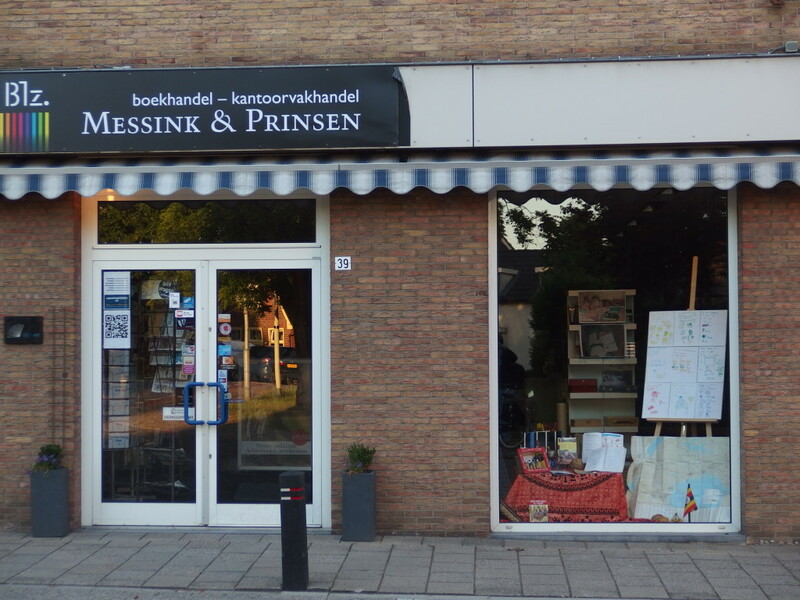 During our visit we bought quite a few new books and we gave Apollo the toys we had brought from Holland. 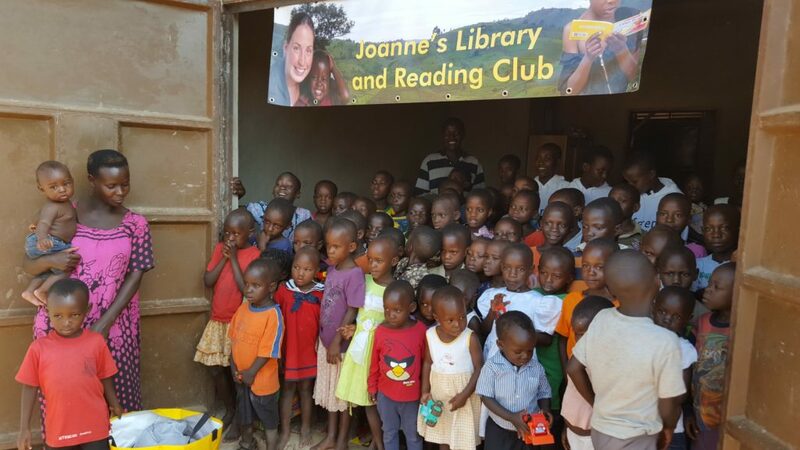 During the day, in the weekends and during the schoolholidays an average of 80 children visit Joanne’s Library to learn to read and write or just to play. The Library is especially meant for those children whose parents can’t afford to send their children to school. 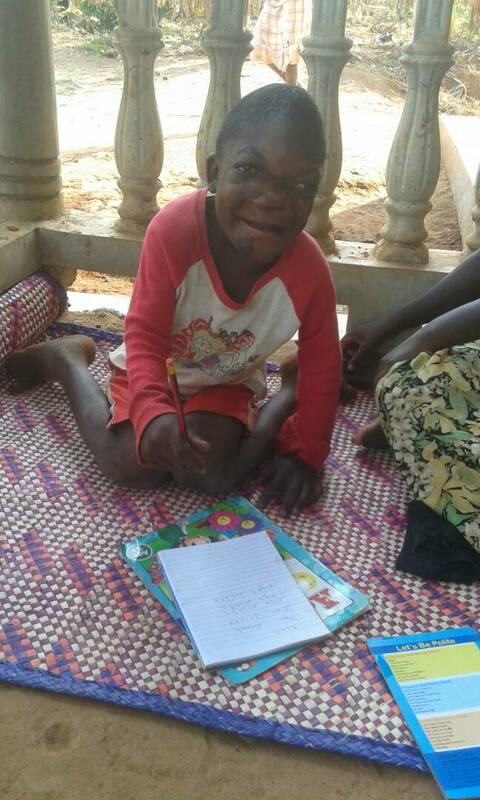 Innocent is doing her best to teach them the simple basics of reading and writing. Godfrey can neither read nor write but he is a clever stayer. 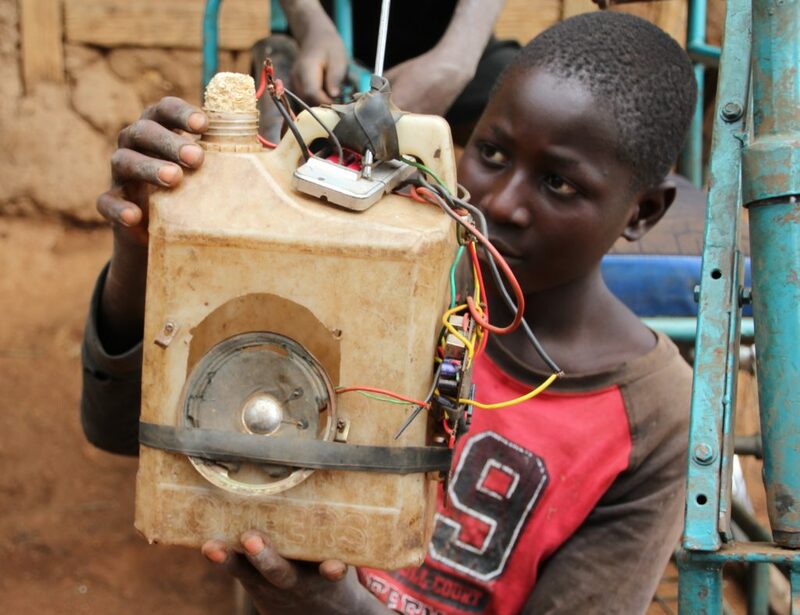 He farms the land next to his mother’s hut and he has made a radio using loose parts. Unfortunately he has deformed lower legs. 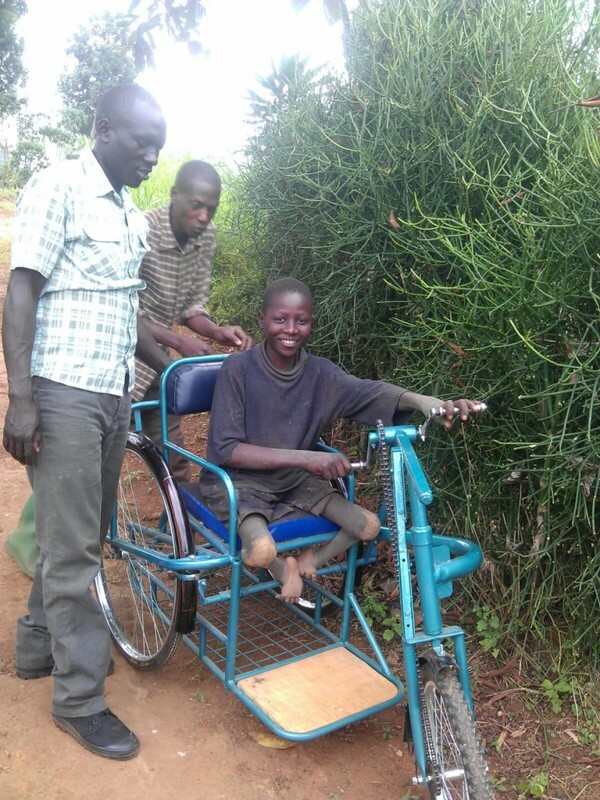 Through the Joanne Foundation the Liliane Fund has given him a handbike. During our visit we told him that we will help him go to school. He was so very glad when he heard this. My Book Buddy is an international program which started in The Netherlands and is concerned with promoting reading. 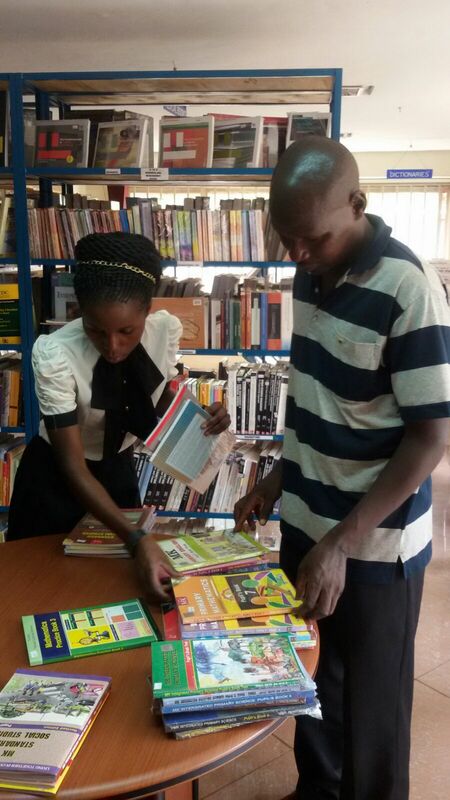 It is a program that donates books to schools in third world countries and also arranges the way the books are lent to the students and explains the way teachers can use these books during their lessons. 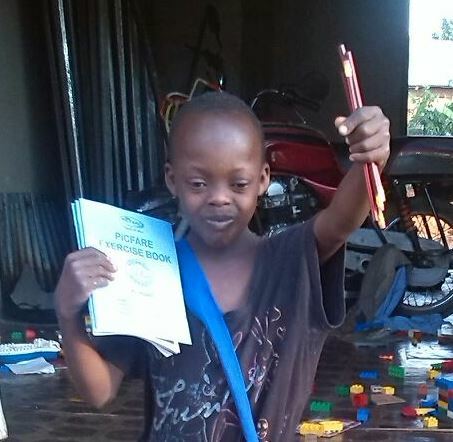 Since February the Ndegeya Church of Uganda School participates in the My Book Buddy project. Special bookcases and bookbags were donated to the school by My Book Buddy and the Joanne Foundation donated 491 books. 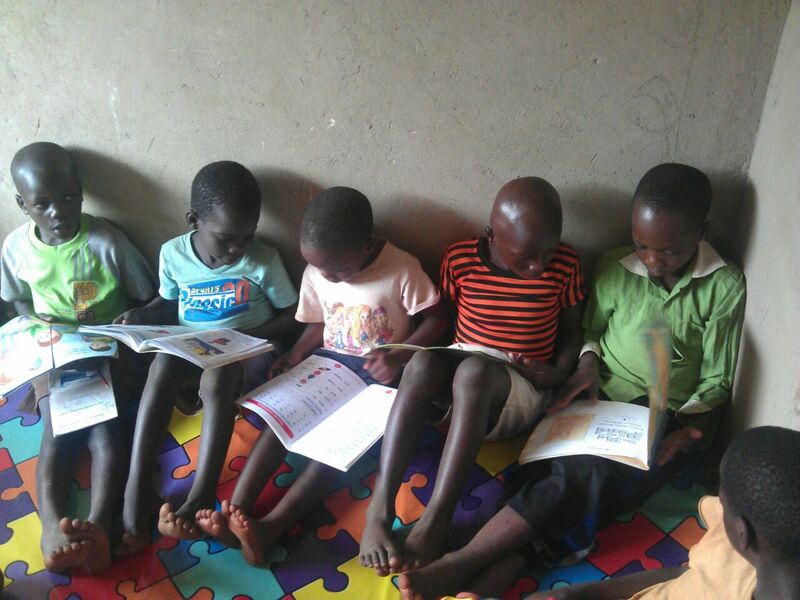 During our visit we were told that the children now read an average of 9 books a year and that this has a notably positive influence on their reading skills. In 2006 Joanne’s first “Ugandan child” in was Grace. 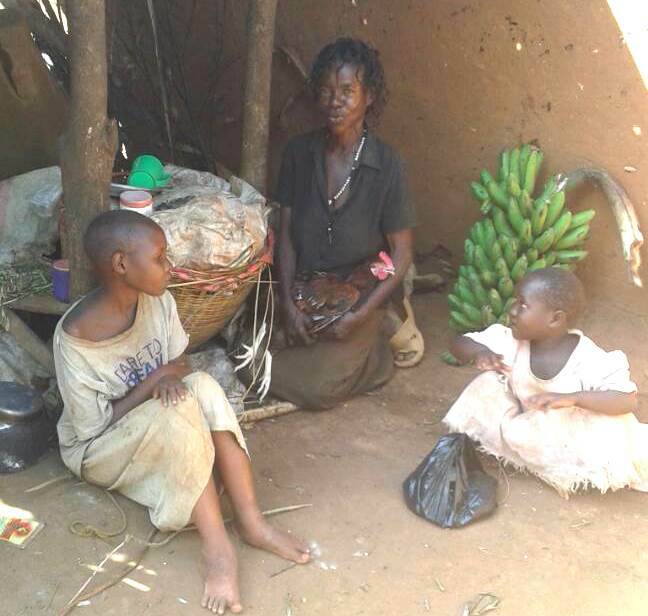 When Joanne worked at the Jireh Children Centre Grace lived with Joanne in her small cottage. They became very good friends. Thanks to Joanne, Grace was able to finish teacher training college a few years ago. She now has a job, she is married and in January her first baby is due. From 11 till 21 October Helma and Arent visited Uganda. They were joined by their good friends Arjen and Brecht. Again it was a worthwhile visit and Arjen and Brecht reported their experiences on Facebook. “Accountability. A word most used during the conversations we had with others. 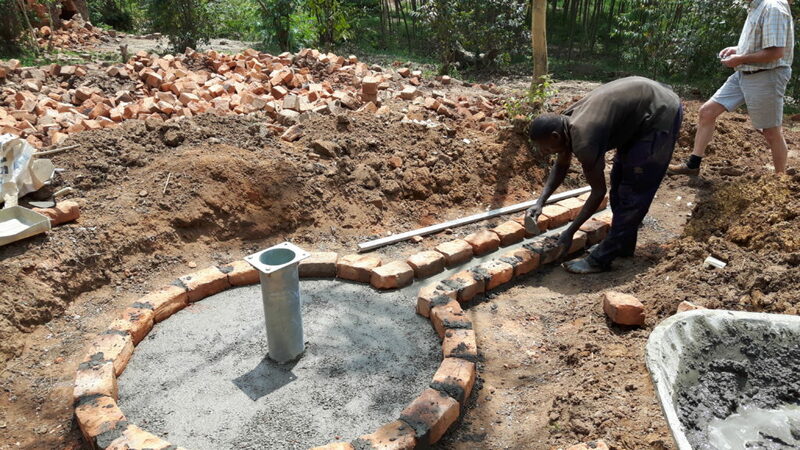 Not only used by us but especially by the school principles we visited, by nurse Kakande, by Bakka Godfrey who installed the water pump, by the village leaders and more than anyone else by Apollo. These people don’t take our support for granted. They are visibly grateful, sometimes even emotional, because they experience the support they get from the Joanne Foundation also as a moral support. They are not on their own in trying to achieve a better future for the next generation. 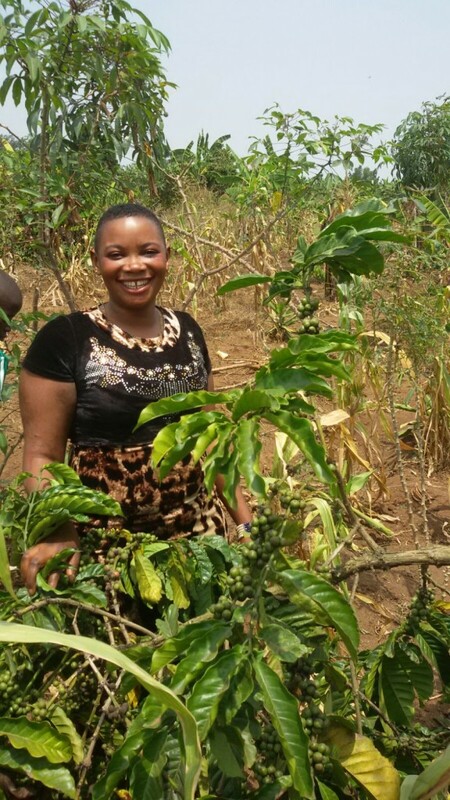 We met many hard working Ugandan people and we noticed that the coorperation they experience from the Joanne Foundation sometimes gives them wings. How else is it possible to dig a 24 feet-deep water well with only a spade and pick-axe in four days! And they all understand that they are responsible for using the wonderful donations well through giving us accountabilities of their expenses. At the moment the Joanne Foundation is able to pay the schoolfees, boardingfees and school requirementsfor twelve children in Uganda. We are talking about Phiona, Tendo, Agape, Miracle, Brenda, Joanitah, Jireh, Hannah, Owen, Ron, Ritah and Ruben. There is also a (varying) group of children for whom a part of the schoolfees and school requirements is paid. 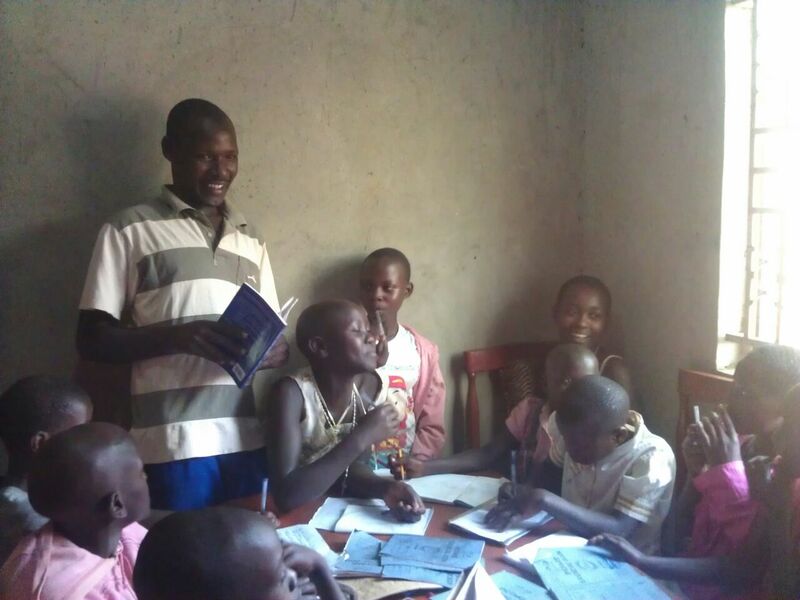 But there are also a number of children who cannot go to school because there is no money and this group is able to go to Joanne’s Library and Reading Club to learn how to read and write. 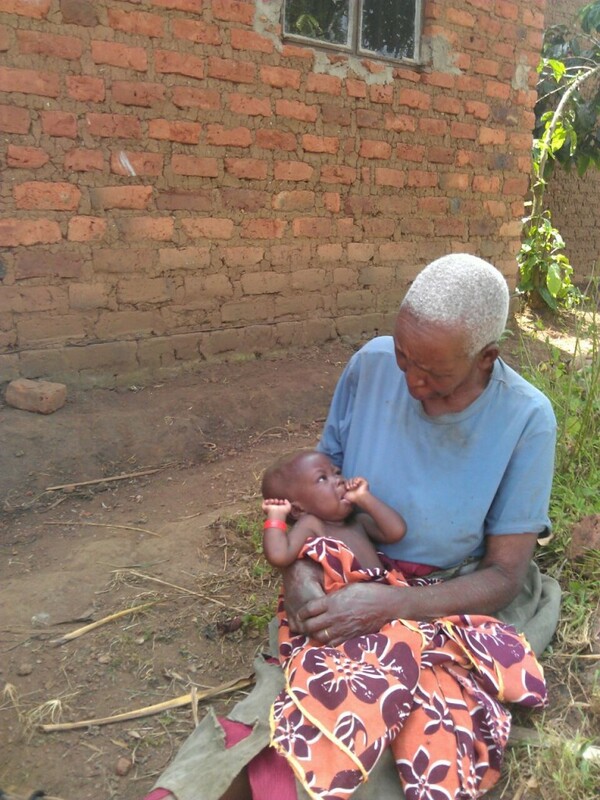 One afternoon, when nurse Kakande was visiting some old ladies, a young woman came to him carrying a baby girl. 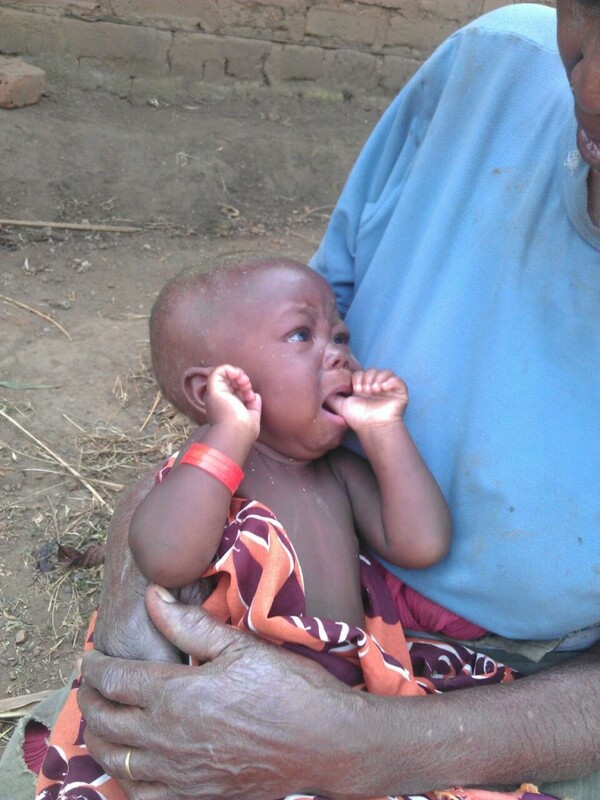 It appeared that her nine-month-old baby had been in hospital because of undernourishment. 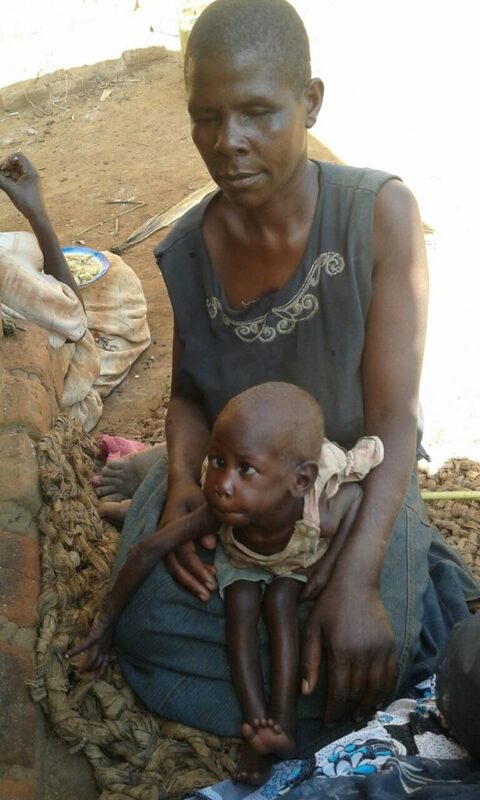 Because the mother could not pay the hospital bills she had taken the baby with her and left her with the old women. 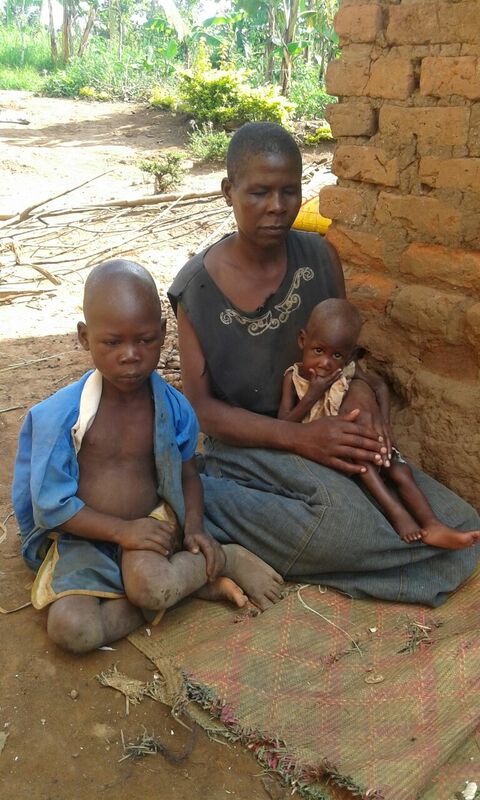 She told them that her husband had died of aids and that she had no money to take care of her child. 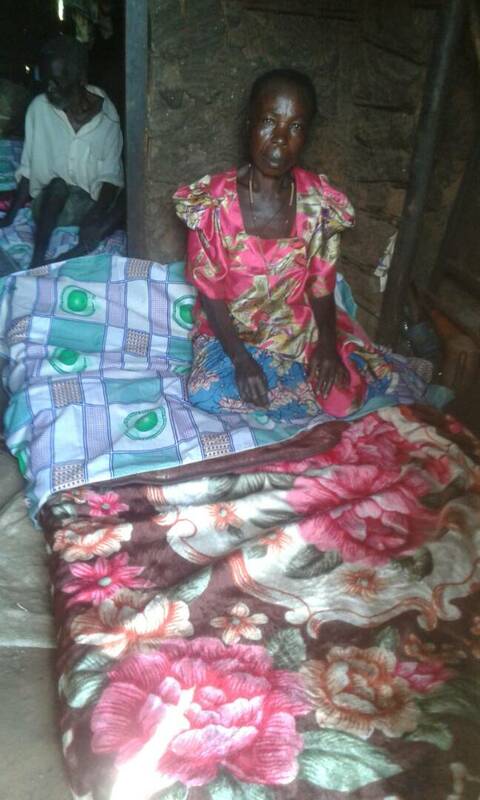 She gave the hospital files to nurse Kakande and left. Because the old ladies don’t have the means to look after the baby, we decided to give them enough food for the little girl. We hope the mother will return soon to look after her own child. 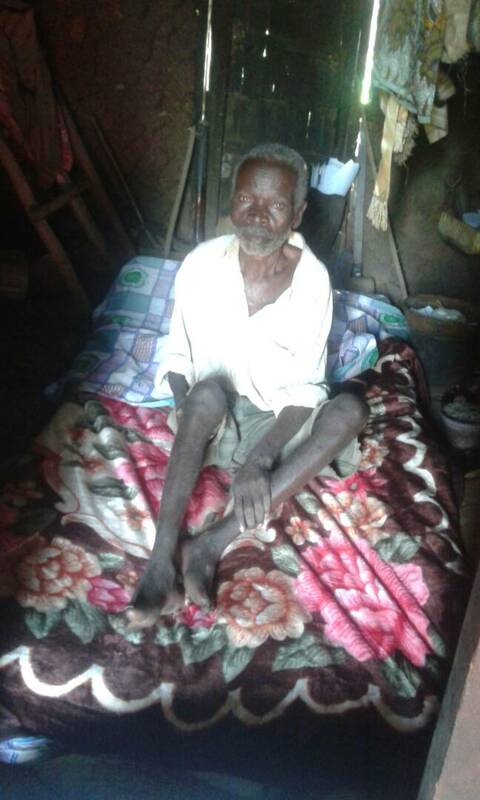 The 92-year-old Nalunga Margaret could hardly walk because her feet bothered her very much. It appeared that a lot of jiggers (sandflees) had laid many eggs under the skin of her feet. These jiggers eat away the tissue and if not treated properly, leprosy-like deformation of the feet will occur. 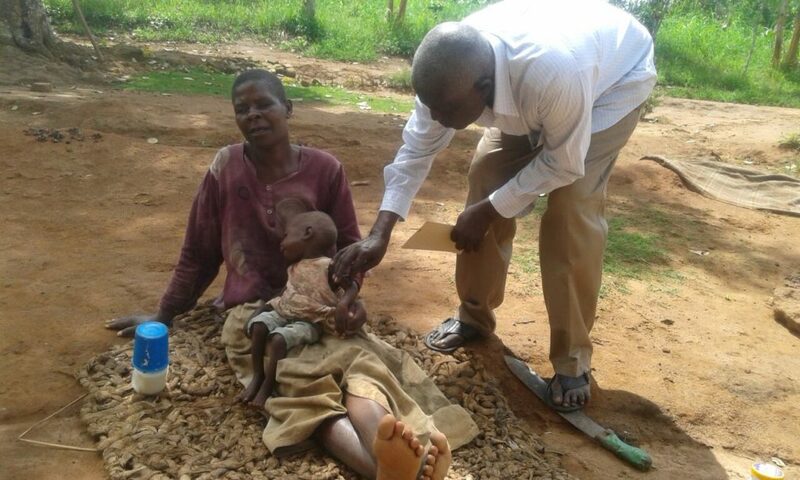 Nurse Kakande was able to treat her while doing house calls. 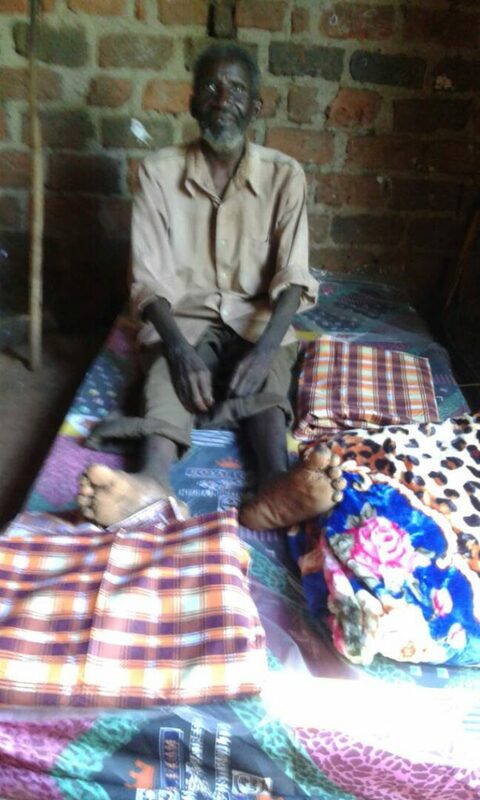 As you could have read in Anja’s travel report the Joanne Foundation has decided to try and improve the healthcare for the chronically ill single elderly people in Ndegeya. 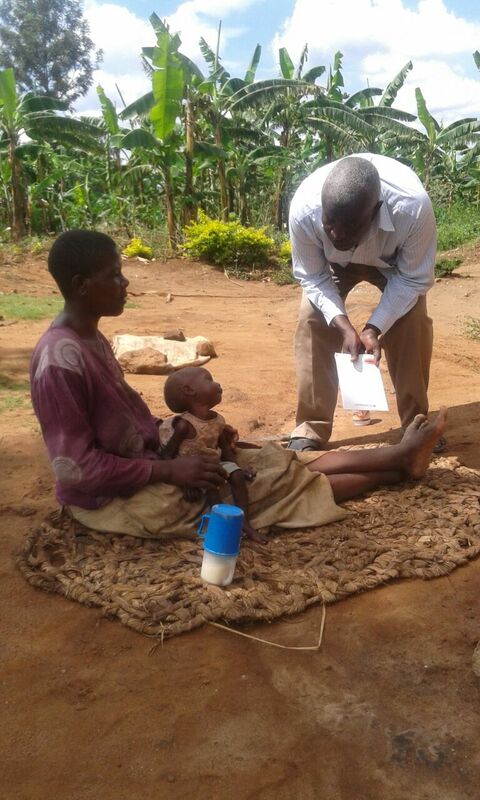 We contacted district nurse Kakande and together with Apollo he wants to help us improve healthcare in Ndegeya. Besides giving medical care to the elderly people he also wants to provide information about preventive health education, the “Health Education Plan”. He has written down plans on how to achieve this in the coming years. We are happy that we, the Joanne Foundation, are happy to help him financially, thanks to your support. Good news! 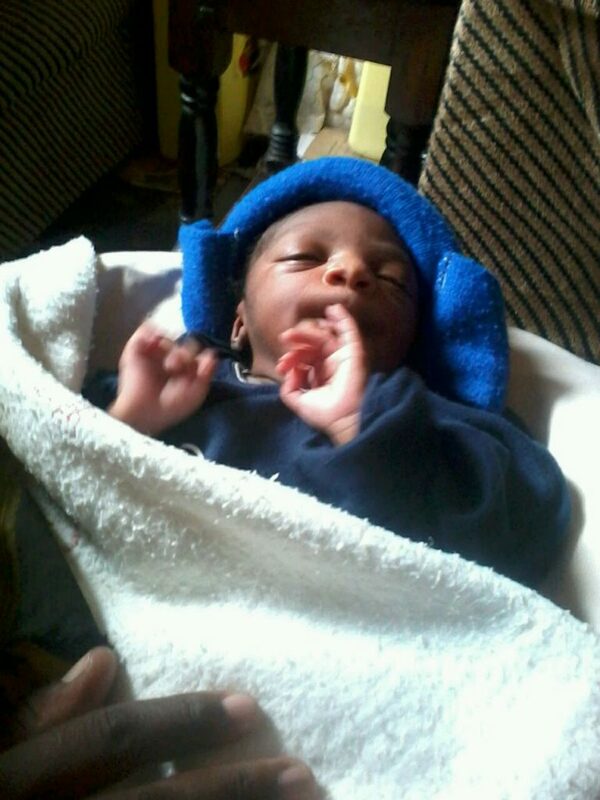 On Friday 27 May, Innocent, Apollo’s wife, delivered a healthy baby-boy. His name is Arent Roland…. Both mother and child are well. Ron, Ritah and Ruben are very happy that they have a baby-brother. 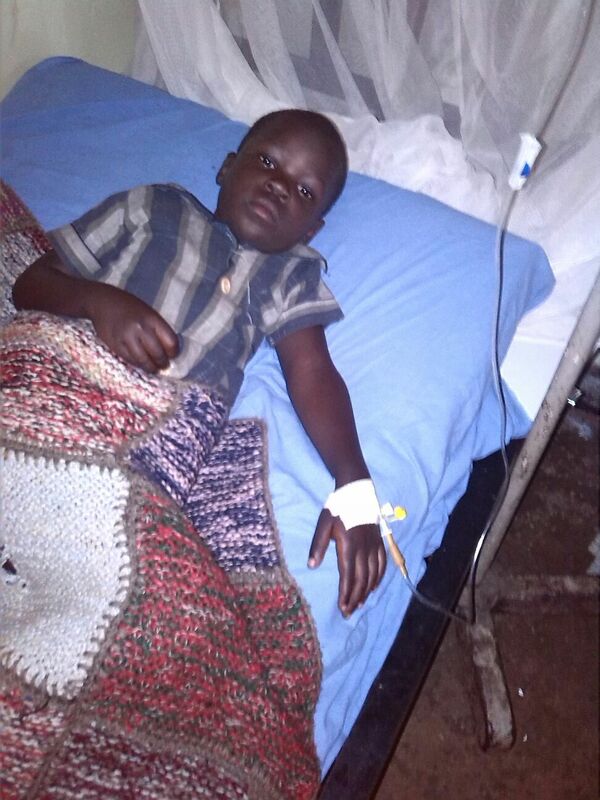 We are relieved that all went well in spite of the bad accident Innocent had three months ago. We wish the little guy a wonderful and prosperous future in this lovely family. 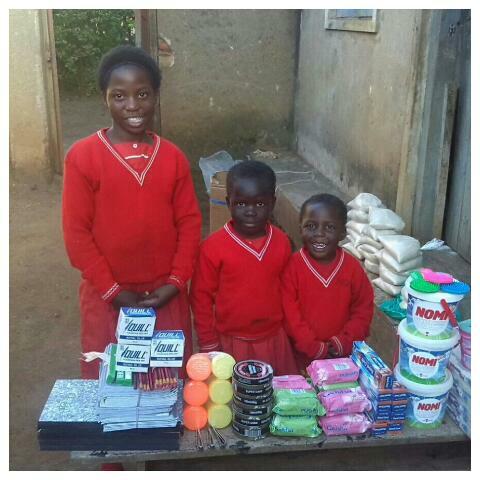 Thanks to the sponsors of the Joanne Foundation, Jovia, the mother of Tendo, Miracle and Agape, started a shop a few years ago. 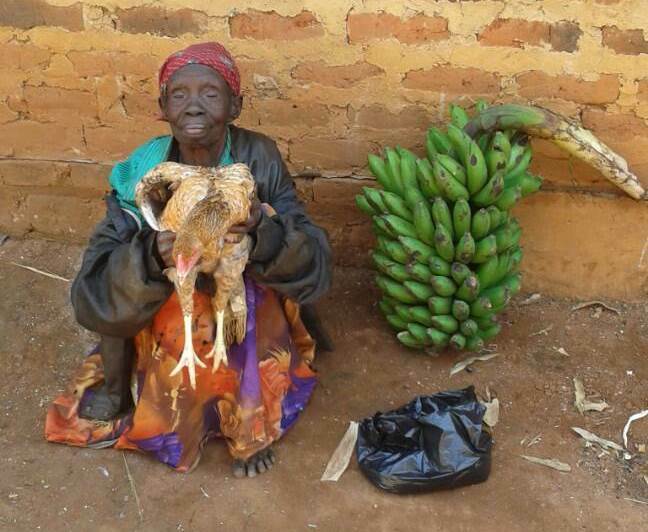 The money she earned she used to buy some land on which she grows corn, bananas, cassave and beans. Because of the drought the crops are not doing too well but we hope the rainy season will help the crops to recover so that she can sell the products in her shop. This will enable her to buy the little house she hopes to build on her land. We admire this hard working woman very much. 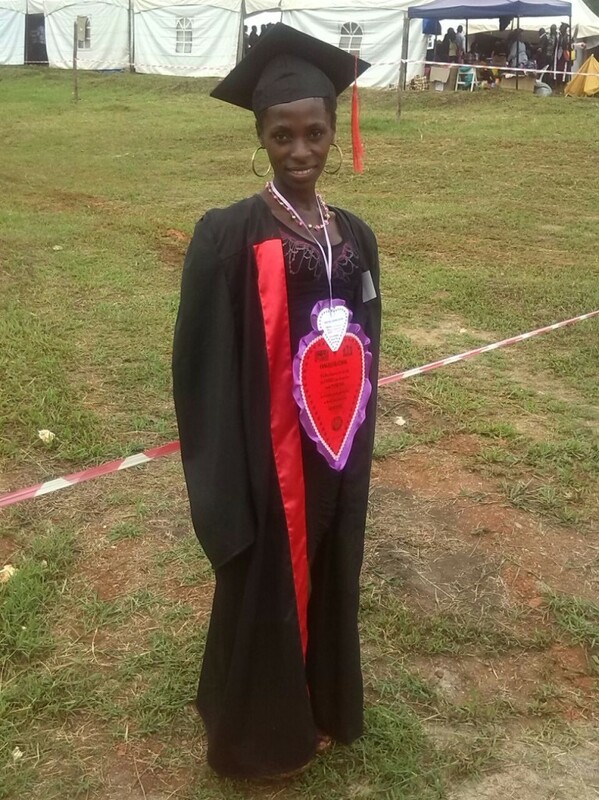 March 18th 2016 was a very special day for Phionah Meeme, one of ‘Joanne’s girls’: it was her graduation day and she received her certificate ‘Early Childhood Development Teacher Education’. A wonderful achievement, especially when you realize that it was only six years ago that she started in 1st grade secundary school and now, six years later, she has finished high school and a part her vocational education. 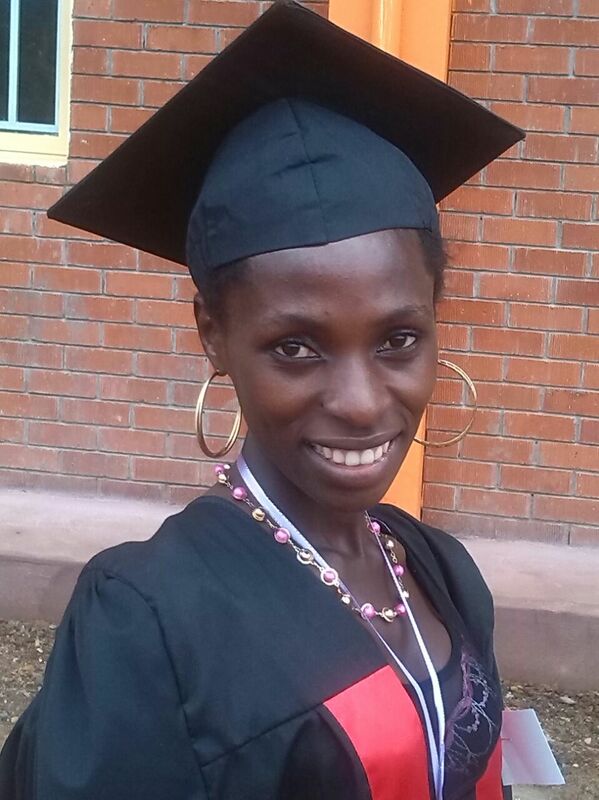 At the moment she works as an assistant teacher in a primary school and she just started her diplome program to become a qualified primary school teacher. Joanne would have been very proud of ‘her’ Meeme. For the kids in Uganda the new school year has started 4 weeks later than usual due to the president elections which took place last week. 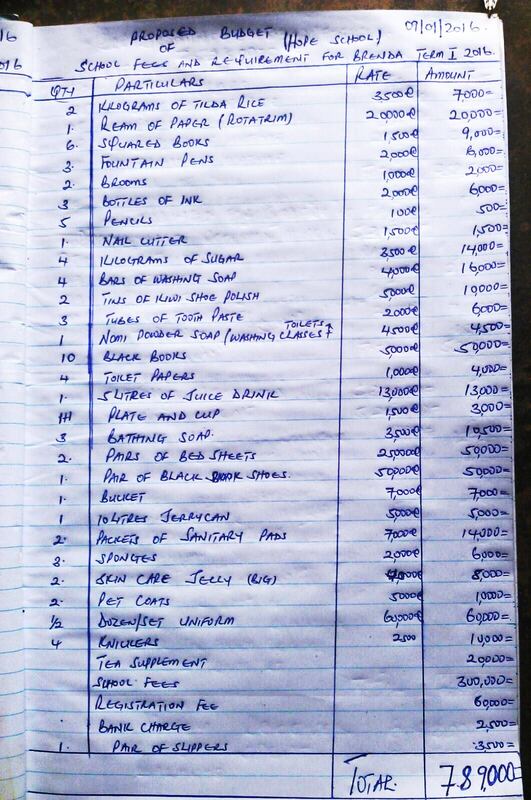 Apollo payed all the school fees and bought all the materials needed for school. 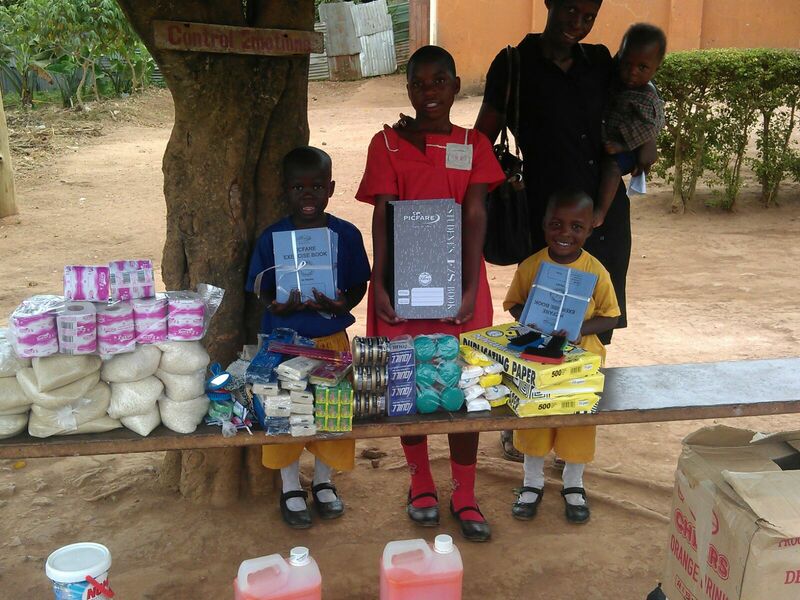 As you know the kids at boarding school have to bring a lot of supplies like rice, tea, sugar, lemon juice etc. If you would like to get an idea you can have a look at Brenda’s shopping list. The kids are excited to start school again. Reading is very good for children. It is good for their language development and they also learn a lot about the world they live in while reading. For that reason we started Joanne’s Library and Reading Club at Apollo’s house in Ndegeya two years ago. An average of thirty children come and read every day. 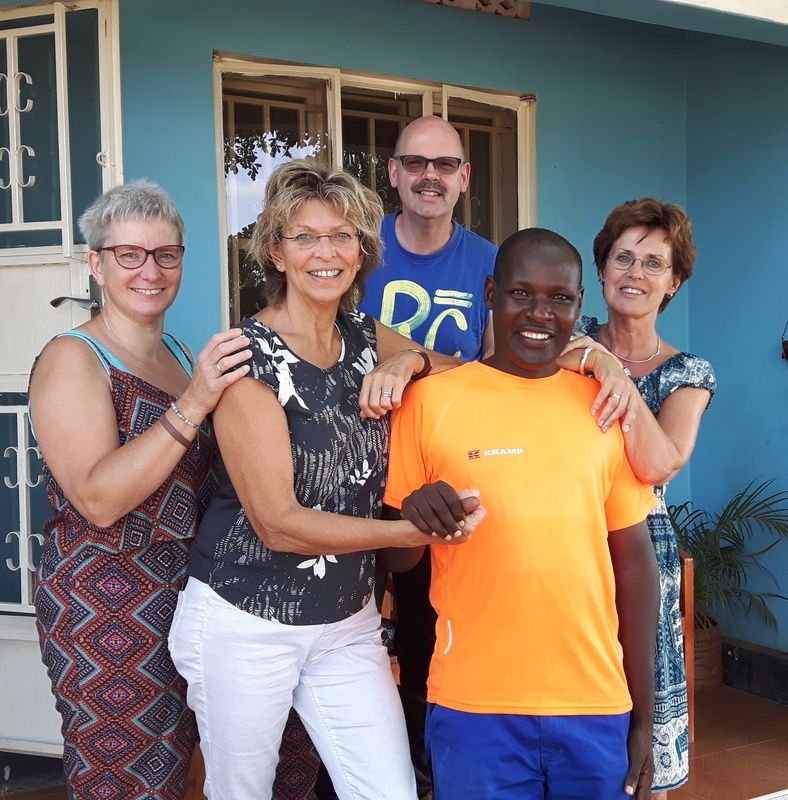 In order to reach more children we are planning, together with My Book Buddy (MBB) project, to help a primary school in Ndegeya to set up a school library. 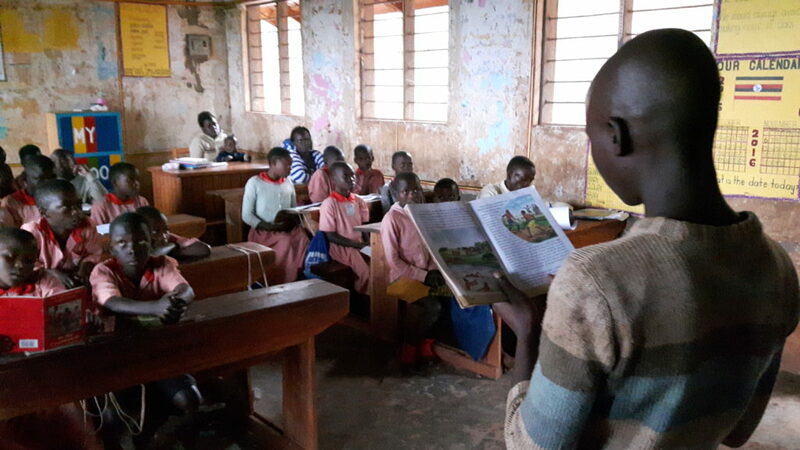 Ndegeya is a very poor village, most parents are hardly able to pay schoolfees for their children so at the school there is no money to spend on a school library for the 500 students. This is what we are going to do: MBB will provide a bookcase for every classroom, these bookcases will be made by local carpenters. The Joanne Foundation will pay for the books . 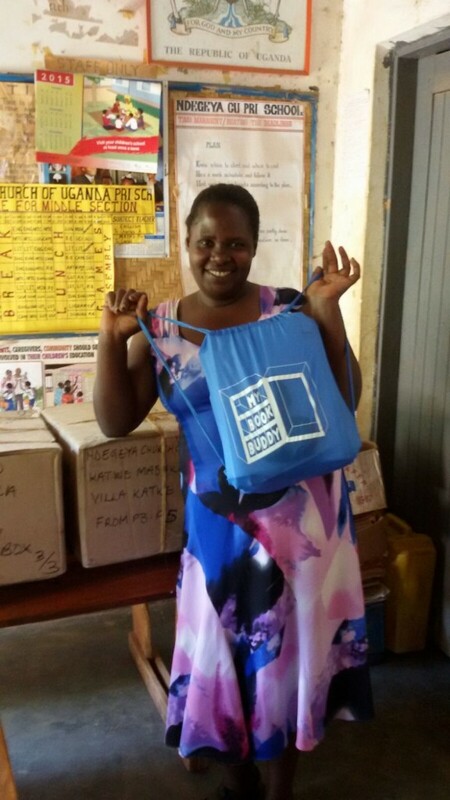 MBB will provide a system that will enable the school to lend the books to the students who will be given a small backpack to take the books home with them. Last week Apollo bought 500 children’s books so all the students will be able to start reading as soon as school starts again. This will enrich the development of the children and we are glad that the Joanne Foundation was able to contribute by buying the books. 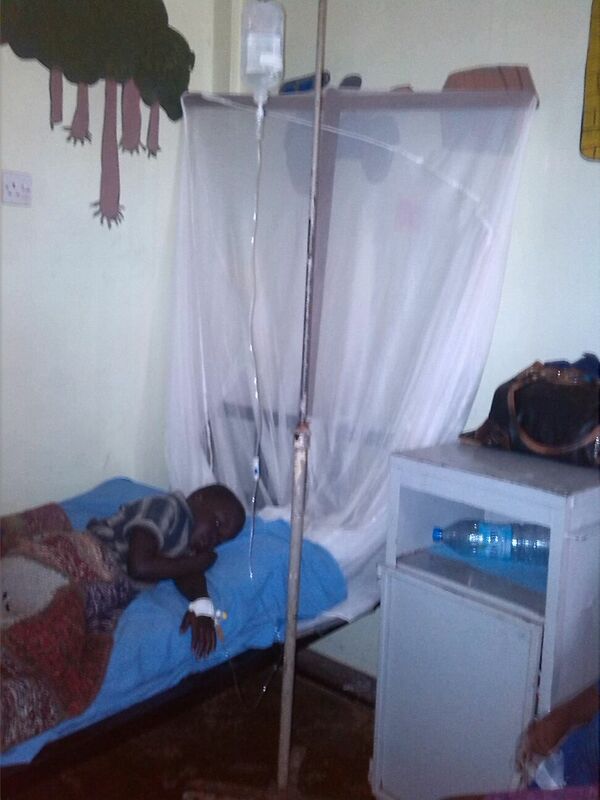 Joanitah is ill at the moment, she has malaria and has been admitted to the Kitovu hospital due to serious dehydration. 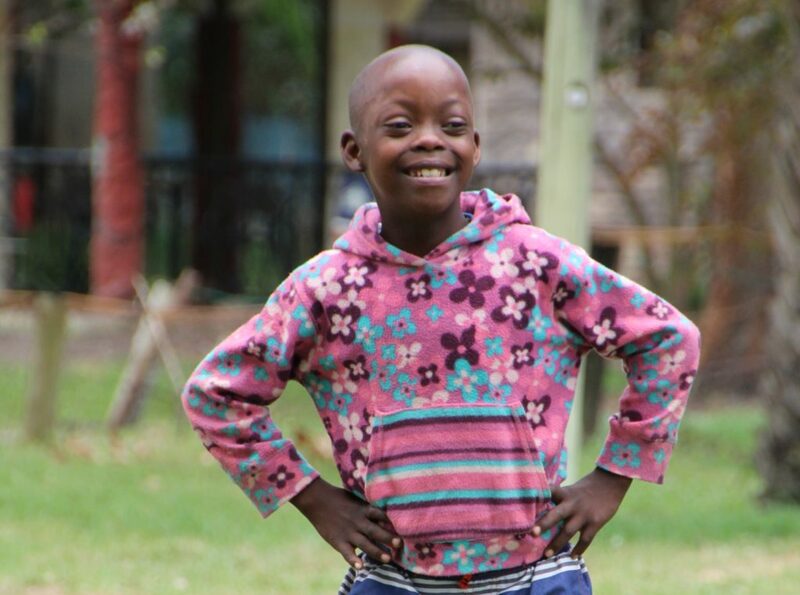 We are so glad that we have a contract with this hospital sothat Joanitah will get all the necessary care she needs. Apollo told us that she is doing a little better now. 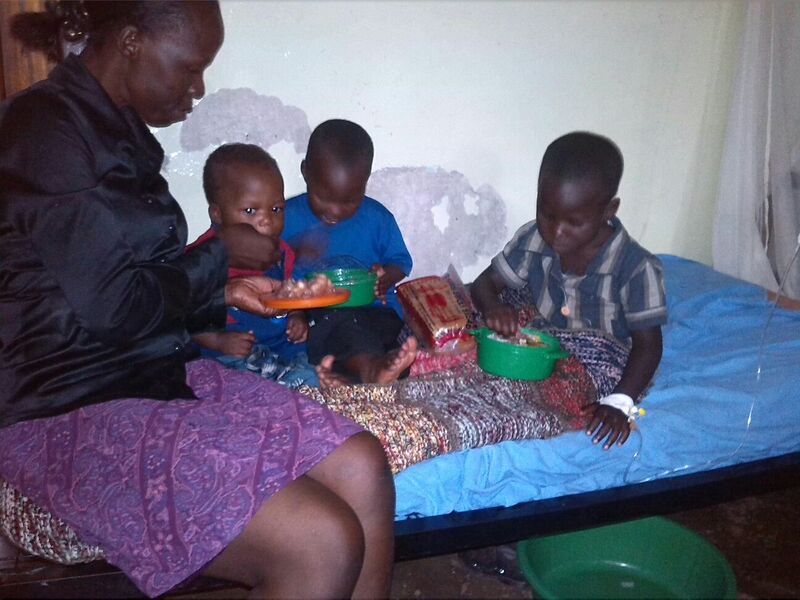 In Uganda it is not the custom to provide the patients with food when they are in hospital, the family has to take care of that. To make sure that Joanitah gets enough food and drink Apollo goes to the hospital to bring her enough food and drink. Ofcourse her mother and brother and sister share the food when visiting Joanitah. 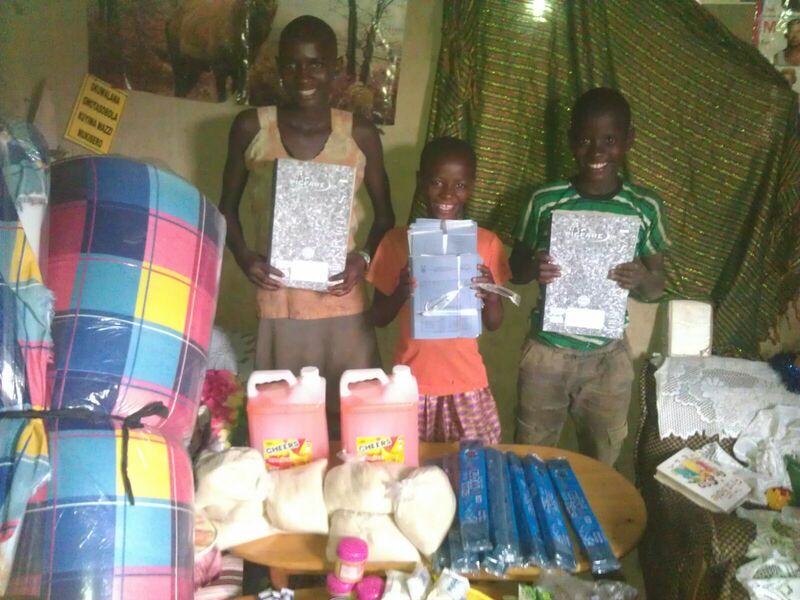 Many colleagues from the Ludger College in Doetinchem have made their christmas presents available to the Joanne Foundation. We thought it a good idea to spend part of this amount on buying something extra (let’s call it a christmas present) for a couple of Ugandan needy families. We asked Apollo to assemble a christmas package consisting of a big (life) chicken, 3 kgs of rice and matoke ( plantain, a sort of banana) and give this to a number of families who are in need of something extra. Families like the family of Jovia, Jennifer, Owen, Godfrey and Cecilia. All are families connected to the Joanne Foundation. On the day before Christmas Day, Apollo gave the christmas package to the families. We are very happy that we were able to provide these needy families with a wonderful christmas dinner. 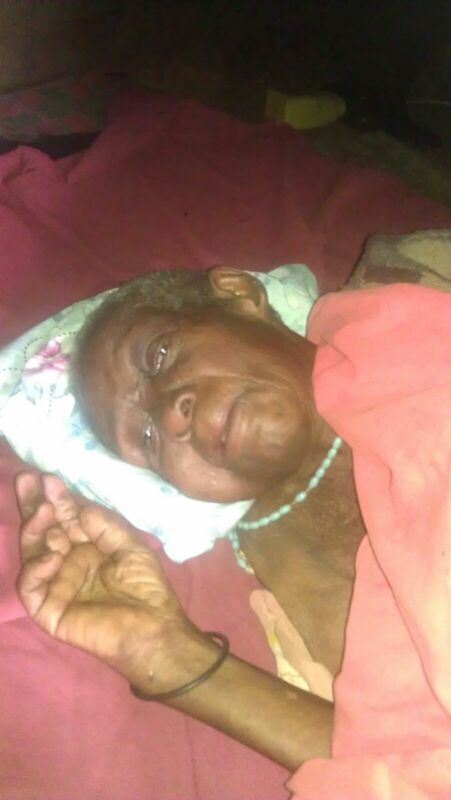 We already told you about the elderly Cecilia and the bad conditions inwhich she has to live. 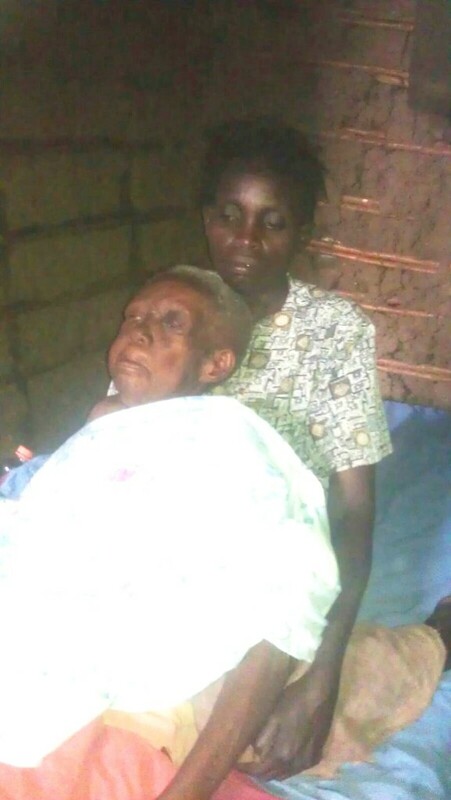 Her health is deteriorating rapidly and thanks to Apollo we have found a woman, mrs. Namulindwa, who is willing to take care of her 24/7. 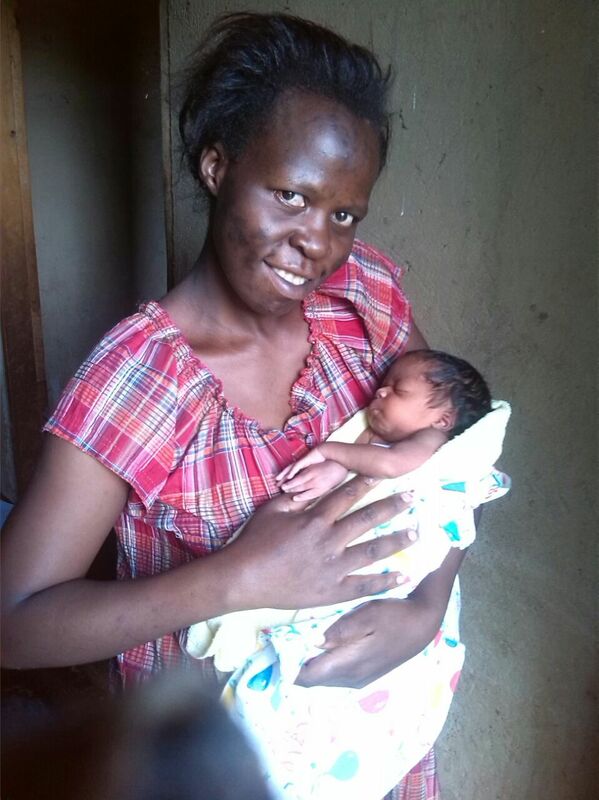 We are happy that Cecilia doesn’t have to live alone anymore and is being taken care of by Namulindwa in a loving way. Apollo will provide Cecilia with food and a doctor will visit her regularly to keep an eye on her condition. 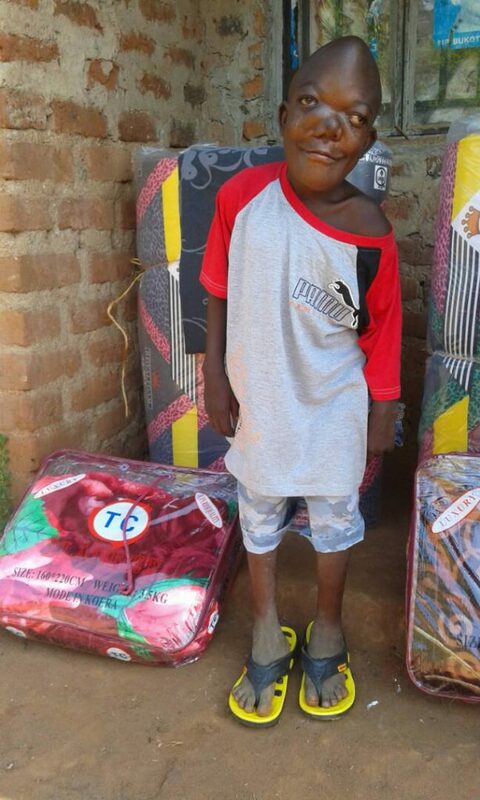 When we visited Godfrey in October this year we found out that he slept, together with his siblings, on on a plastic sheet. 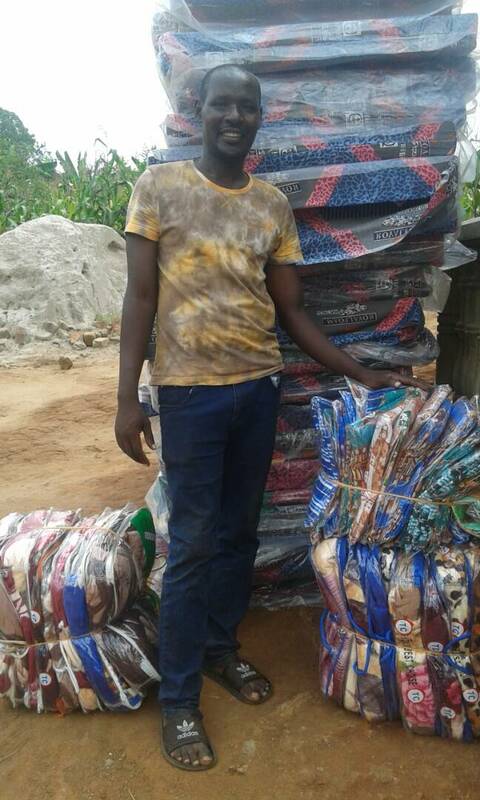 Today Apollo bought mattresses, blankets and sheets for Godfrey, his brother Fred and sister Ruth. 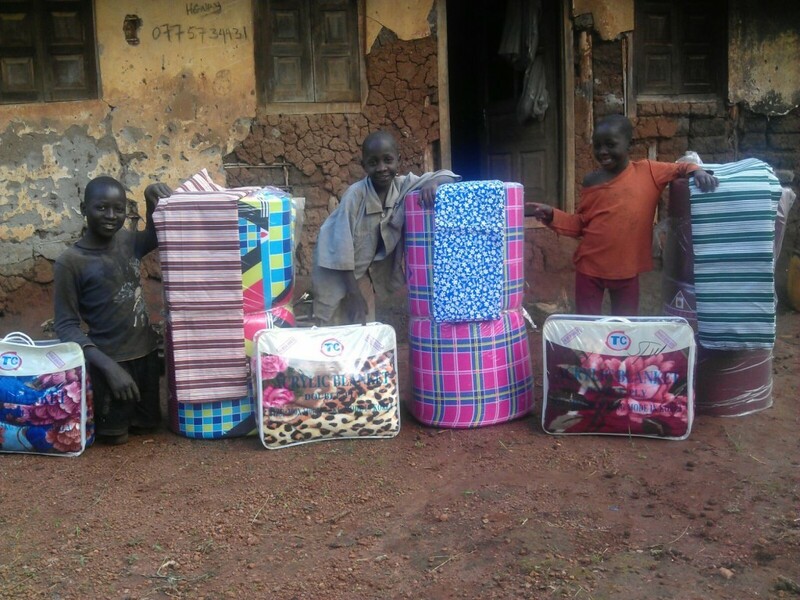 Wonderful to watch their happy faces, they are so pleased with the mattress, blanket and sheets! During our last October visit to Uganda we met Godfrey for the first time. 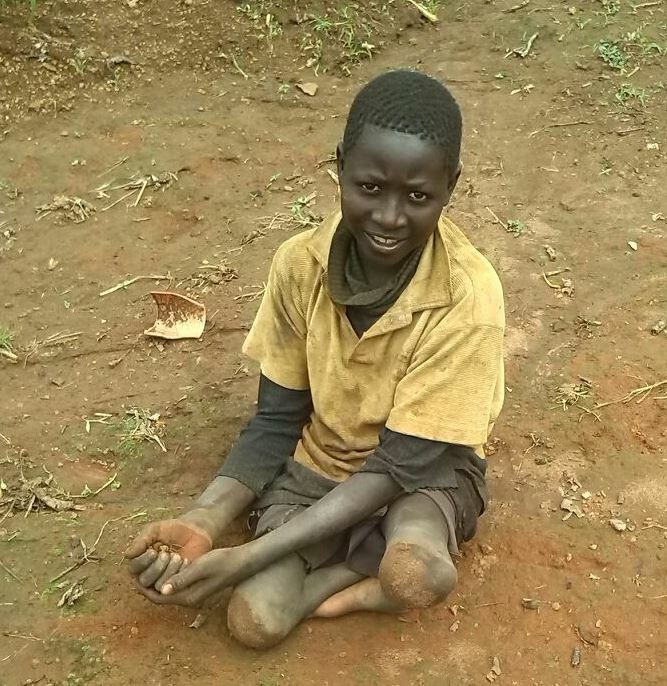 He is a thirteen-year-old boy with a serious physical handicap, he has no lower legs. We informed you about him in our travel report. We told you then that we hoped we could something for him. 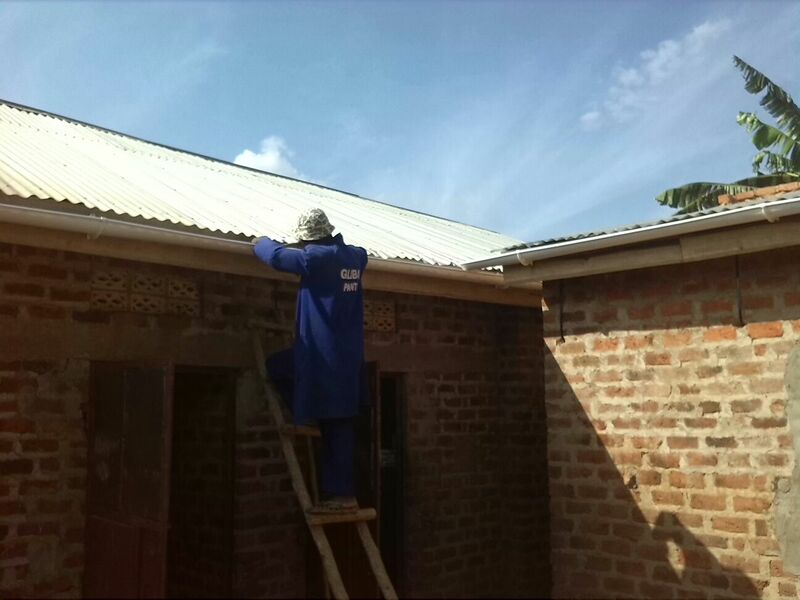 Thanks to the Liliane Foundation we came into contact with “Katalemwa Cheshire Home for Rehabilitation Services” in Uganda. Early December two associates of this organisation visited Godfrey to judge his situation. We are very happy that the organisation has decided to include him in their program! This means that they plan to arrange a handbike for him and knee and hand caps. 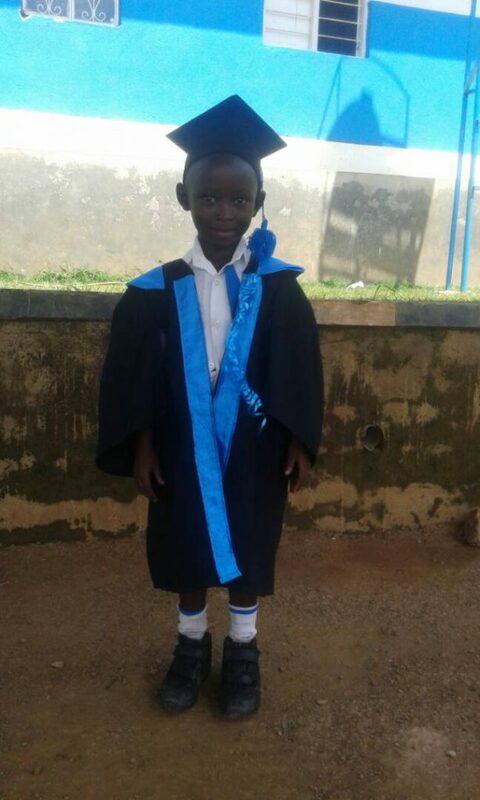 They are also thinking about enrolling him in school or vocational training. We are so pleased that experts are going to take care of Godfrey, this will give him an excellent opportunity to develop himself. Owen is allowed to go to school! We have some wonderful news about Owen, the boy with Down Syndrome, about whom we told you before. Owen has been locked up in his house for years because his mother was ashamed of him. In Uganda people think you are cursed when you give birth to a handicapped child. These children are often hidden away and left to themselves. Apollo went to Owen’s mother to talk her into allowing Owen to join Joanne’s Library and Reading Club to play and learn to read. From that moment Owen was allowed to join and he went to Joanne’s Library and Reading Club every day. Apollo’s wife Innocent took Owen under her wings and stimulated him to play and taught him to write his name and she also read aloud books for him. Apollo and Innocent have shown the other children who joined Joanne’s Library and Reading Club that children with Down Syndrome are not “crazy” but just nice children. The people in Apollo’s community now understand that children with Down Syndrome shouldn’t be hidden away. 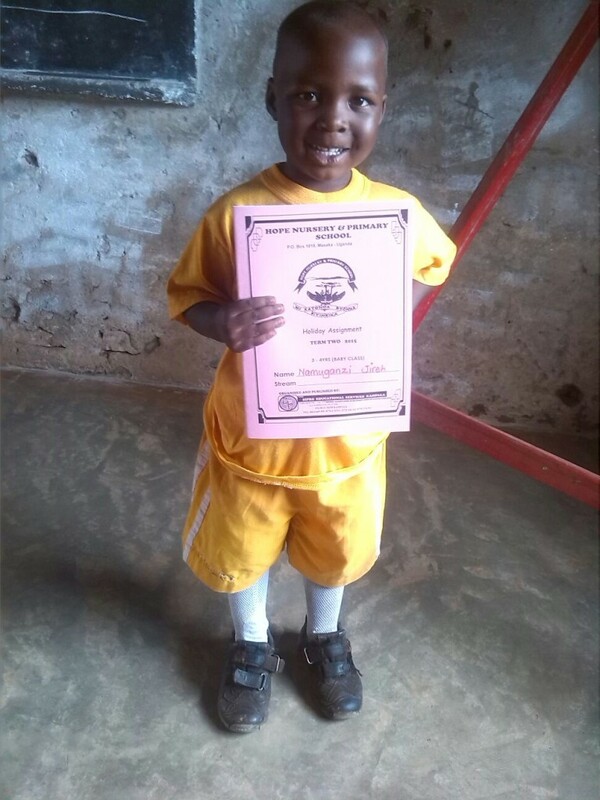 Now Apollo gave us the wonderful news that Owen has been accepted at a school in the neighbourhood! We are grateful to Apollo and Innocent for their efforts to get their community to accept children with a handicap. 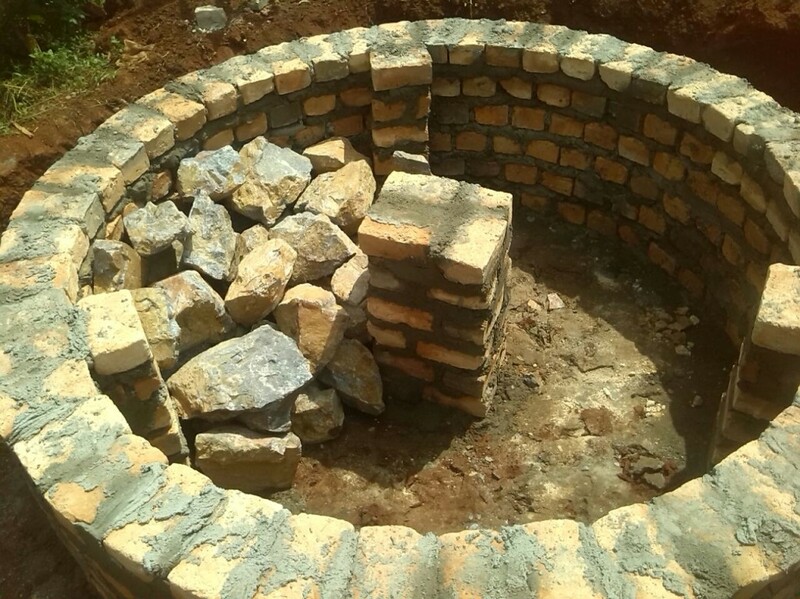 The waterproject of the Little Stars School has finished! 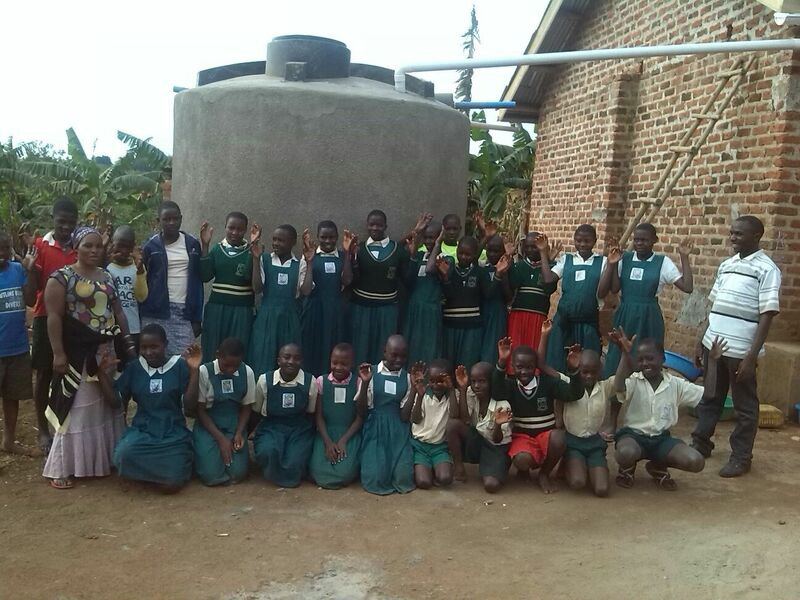 Thanks to a wonderful gift from MondiAalten, the Joanne Foundation was able to help the Little Stars Junior Academy (the school that Miracle, Agape and Tendo attend) to provide their own watersupply. 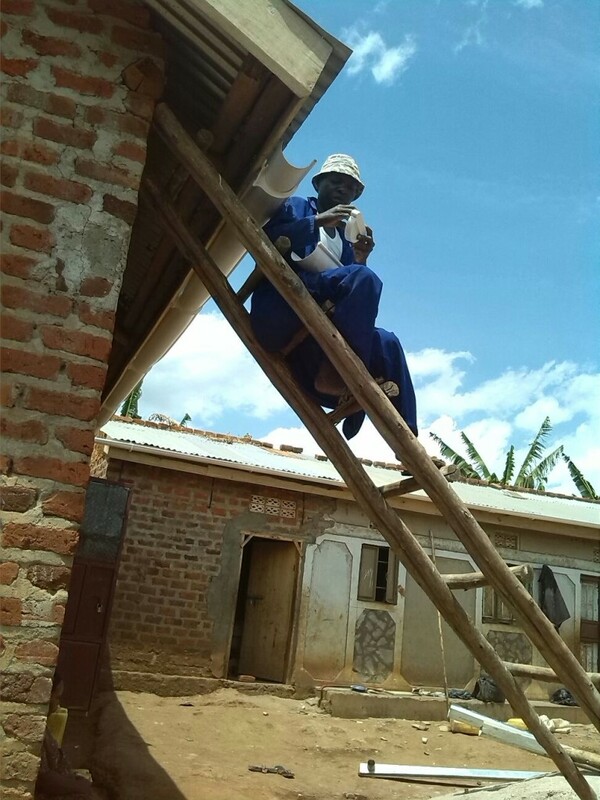 We informed you on 6th August that a watertank had been installed but now all the gutters have been attached to the roof and connected with the watertank. Fortunately it was all done before the start of the rainy season. 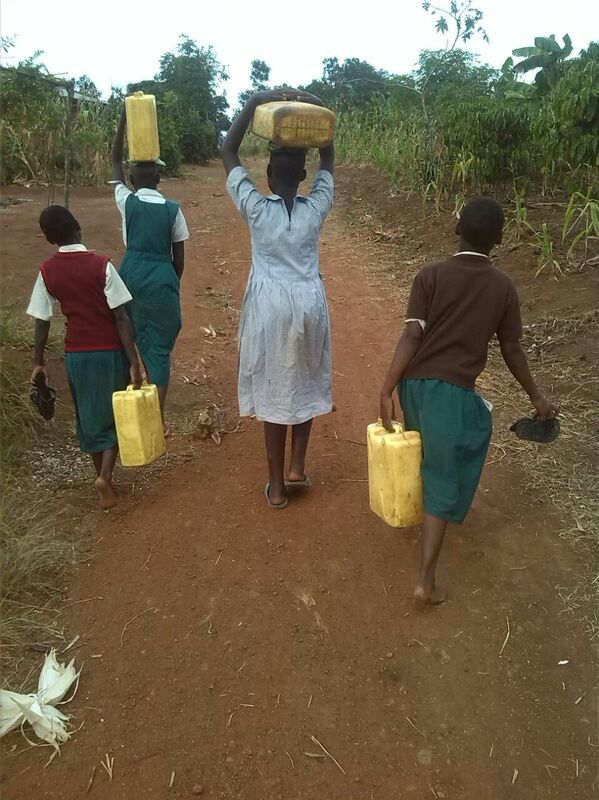 The students don’t have to walk for hours to a swamp anymore but can now use relatively clean rain water. Both students and teachers are very happy! 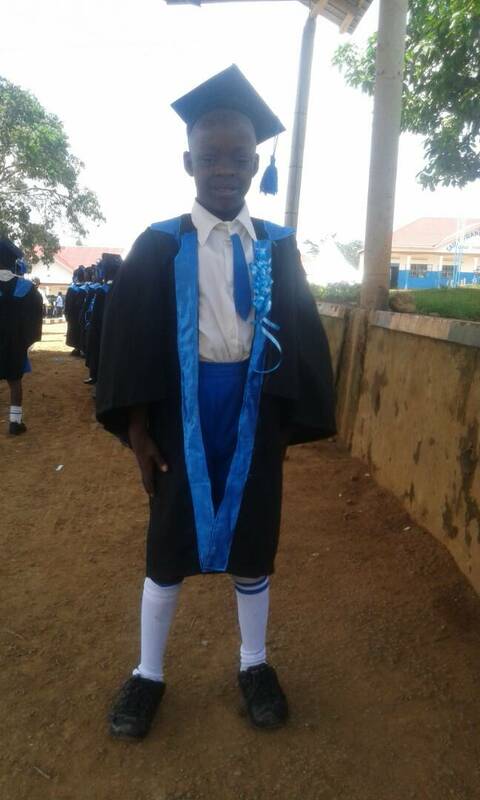 In Uganda the schoolyear is divided into three terms and the second term has just finished. This means that all the children have received their schoolreports and they have a three-week holiday now. 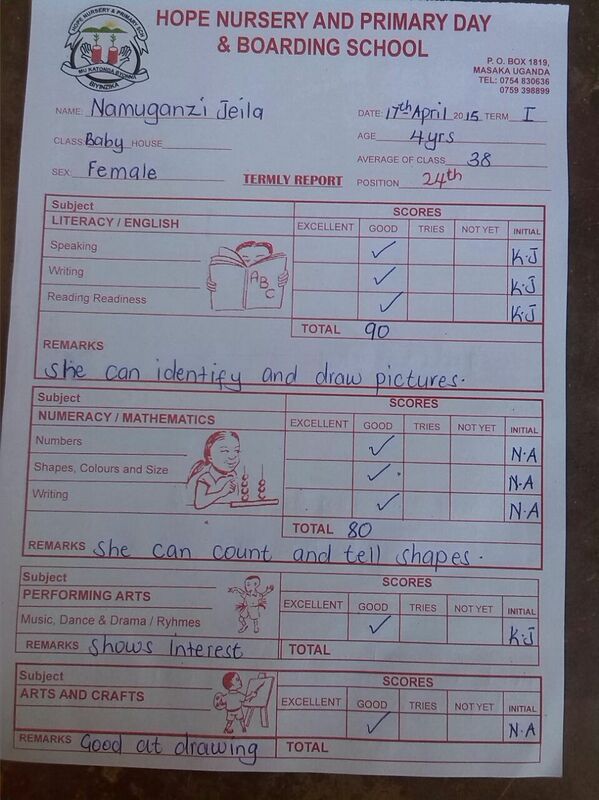 Jireh, who is four years old, has received her “babyclass” schoolreport. 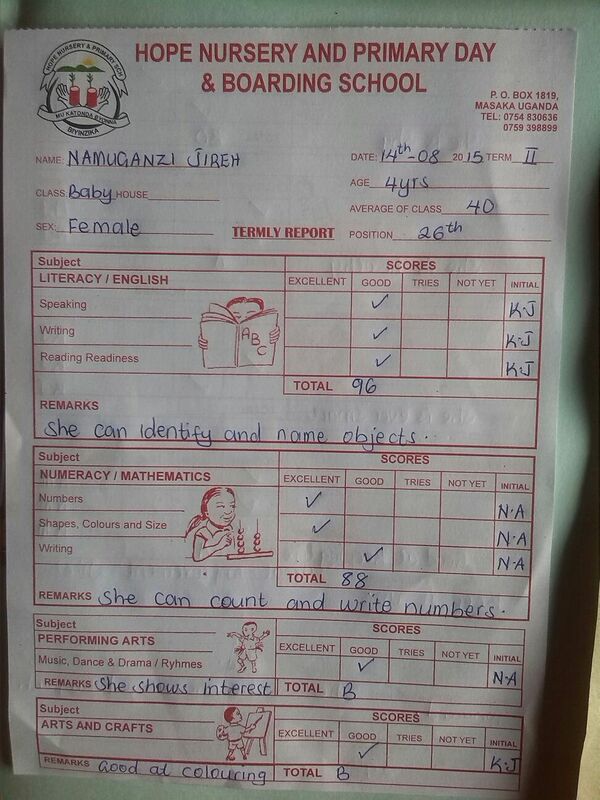 She is very proud of her schoolreport and wants to show it to you all. 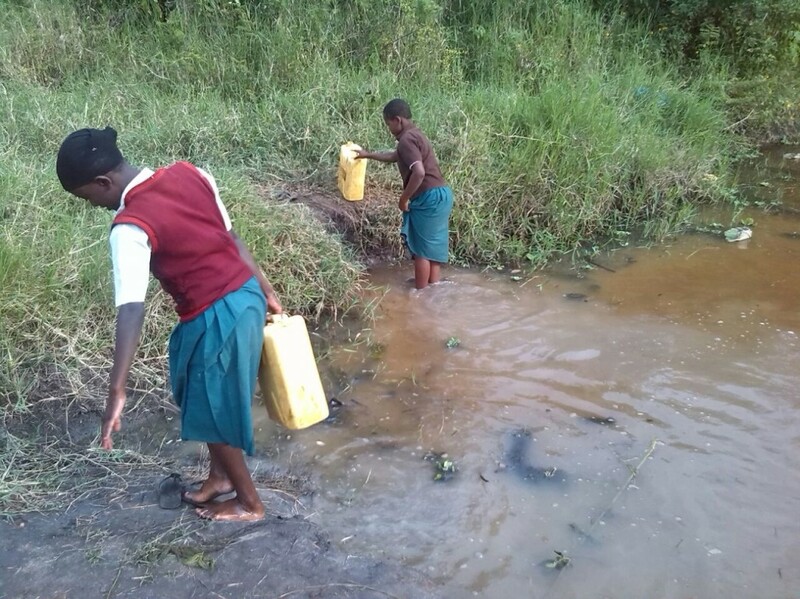 Because of the draught the students of the Little Stars School (the school of Miracle, Agape and Tendo) have to walk a longer distance to collect water. They collect water from a little mud pool which is also used for watering cattle and this increases the risk of fetching diseases. 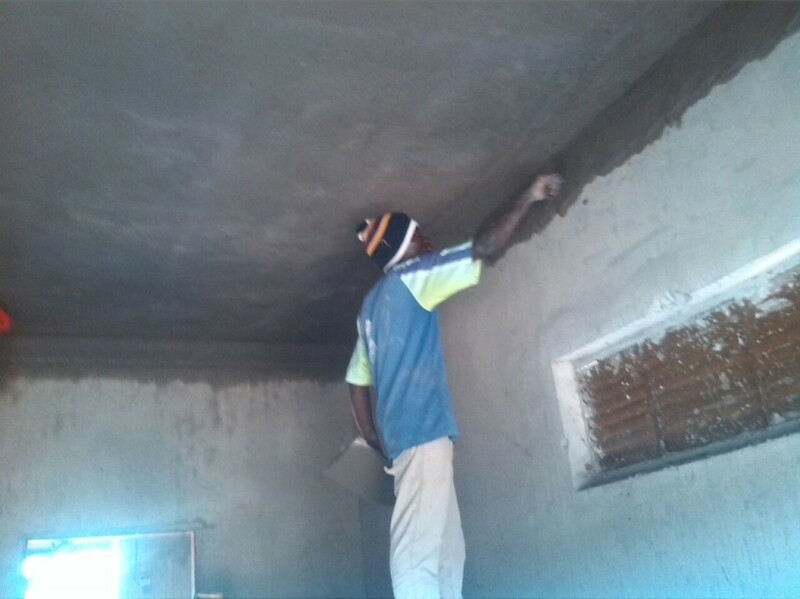 Also thanks to a gift from MondiAalten the Joanne Foundation is able to help this school to build a watertank and install gutters and drainpipes. 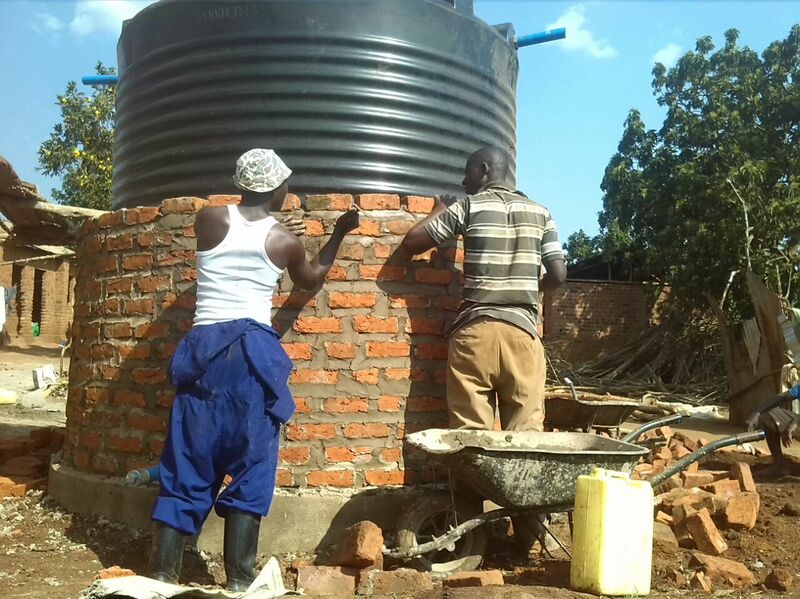 At the moment the 10.000 liter watertank has been placed and very soon the gutters and drainpipes will be installed. 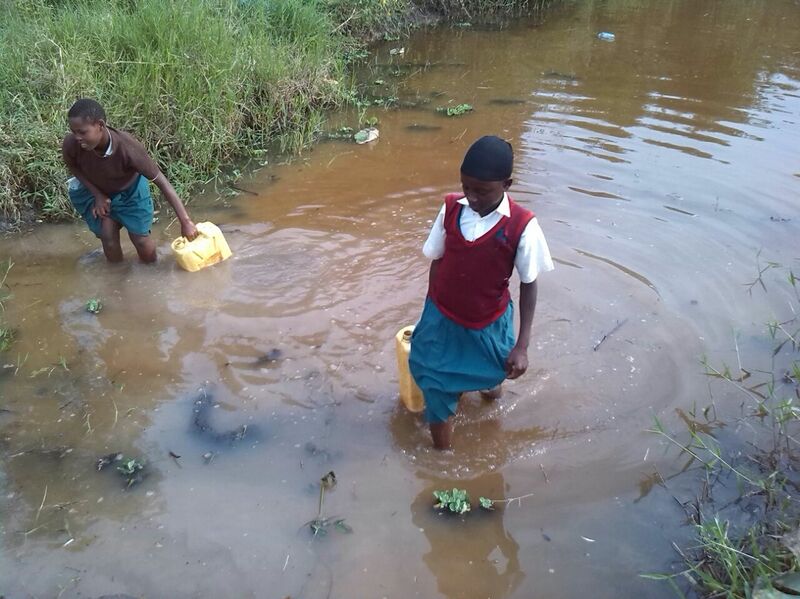 So hopefully the coming rain season will provide the school with sufficient (relatively clean) water. 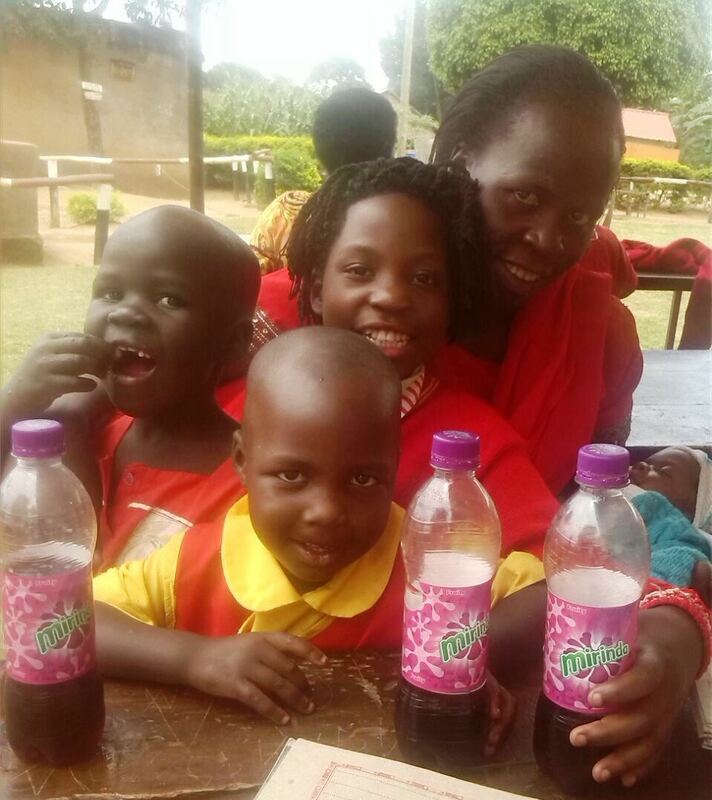 Visiting day is a day the boarding children are looking very much forward to because then their parents come to visit them and to make them a wonderful lunch and buy them a bottle of soda. 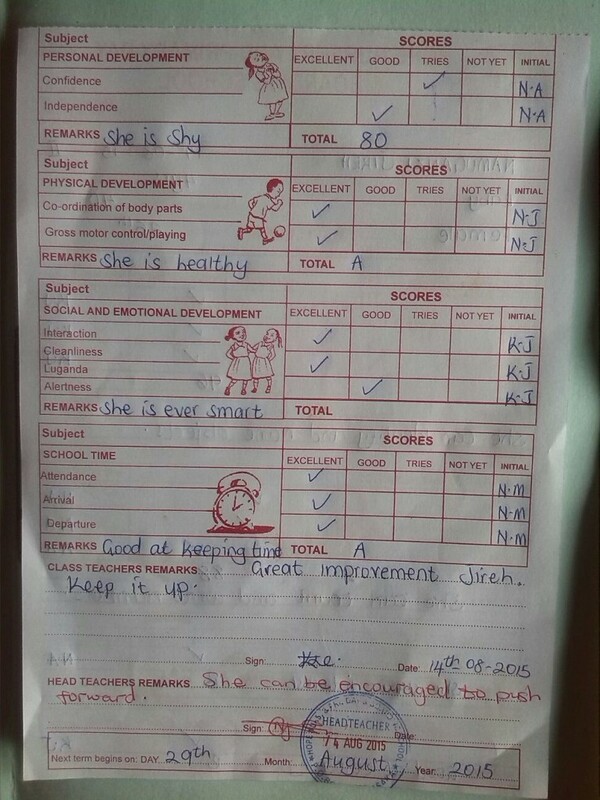 The parents can also talk with the teachers about the results of their children and they get the mid term schoolreports. 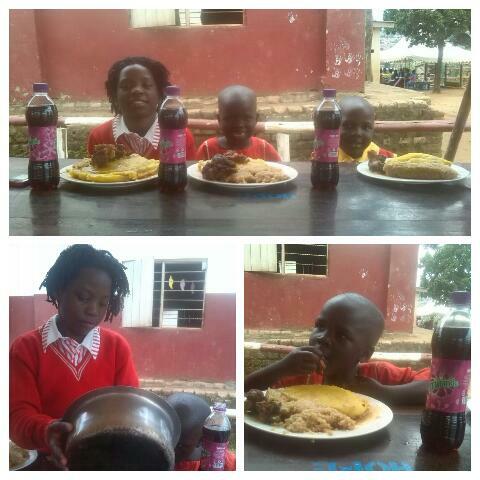 Jennifer and baby Daniel visited Brenda, Joanitah and Jireh and Apollo bought a wonderful meal for the children. It was one big party! 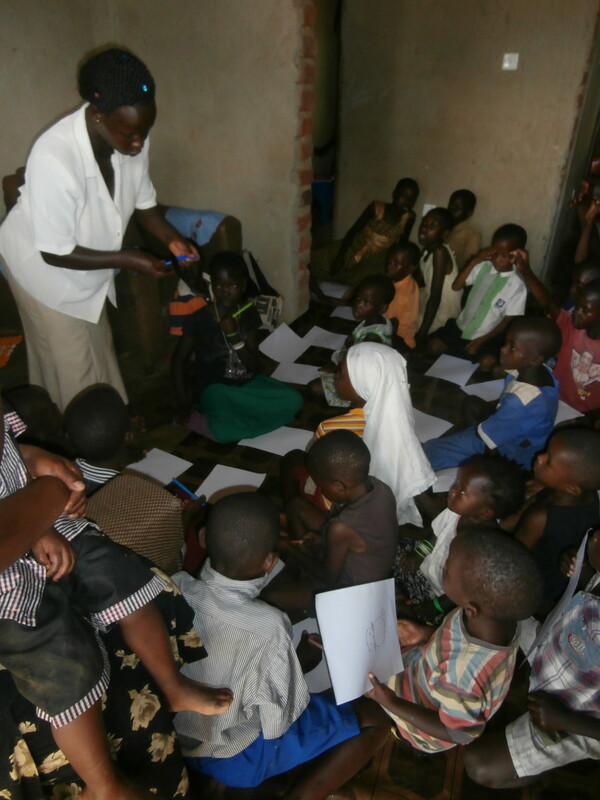 Last winter children living in Bredevoort have made drawings for children in Uganda. 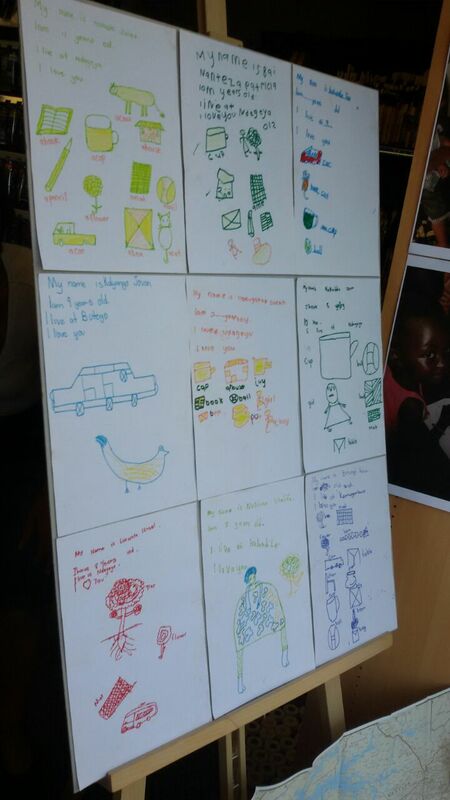 Together with sponsor money Anja and Jacques took these drawings with them to Uganda in February. The children in Uganda also made drawings using the drawing materials given to them by our local bookshop Messink&Prinsen. These drawings are now shown in the shopwindow of bookshop Messink&Prinsen in Aalten. 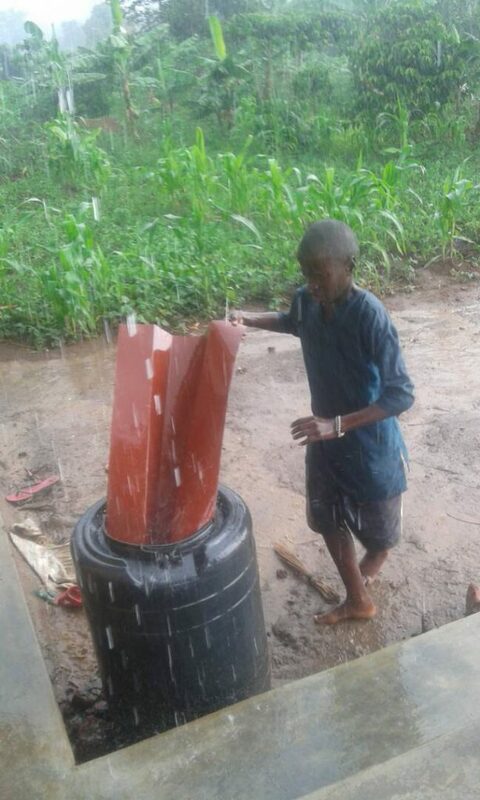 As you know we had gutters installed on Apollo’s house and we wanted to have a watertank built sothat the rainwater could be collected in it. Duet o the rainy season the ground was much too wet for such a heavy tank. The reany season has ended so no wit is possible to build the 10.000 liter watertank. 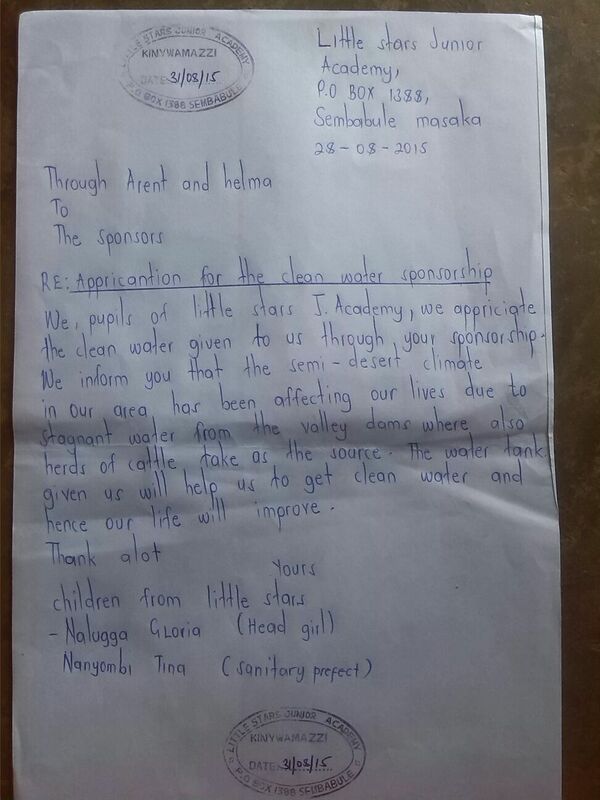 The water is not only meant for Apollo and his family but alsof or the community living in Ndegeya. 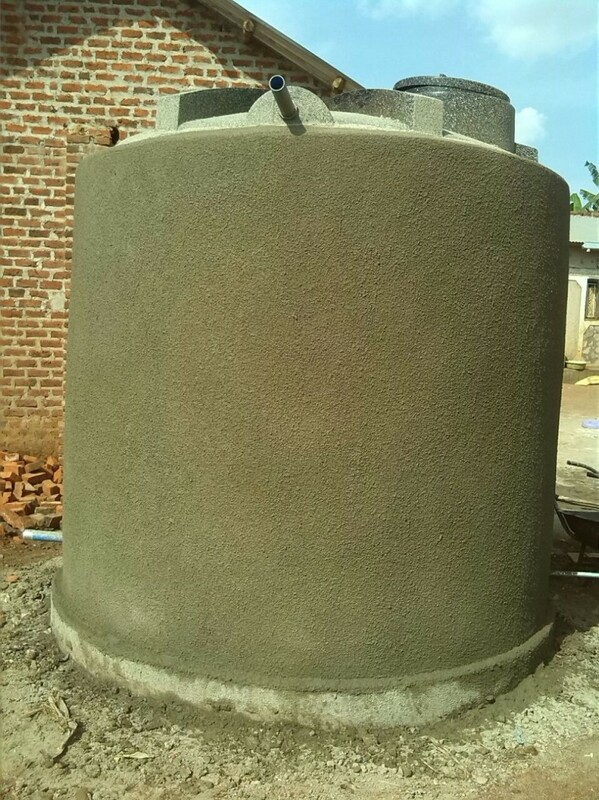 As soon as the cement has dried the building of the watertank will continue. 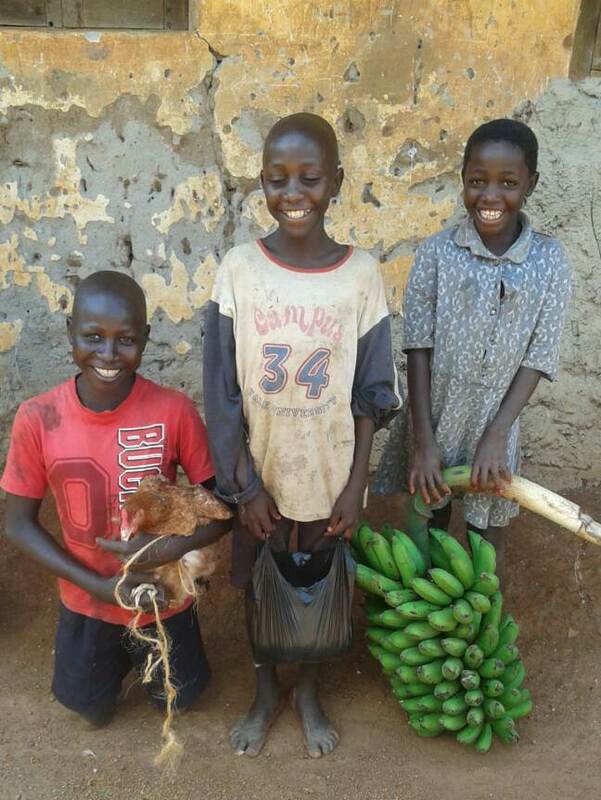 The spring holidays in Uganda have ended and the children are back at school again. For the boarding students lots of shoppings need to be done because they have to take many things with them to school, like toothpaste, soap, toiletpaper, lemonade, sugar, rice, shoepolish, nail clippers but ofcourse also pens, exercise books and so on. 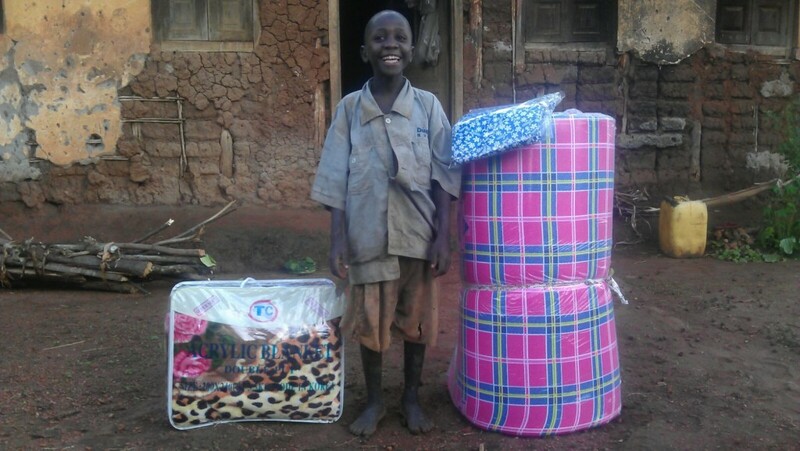 Apollo has paid the tuition and boarding fees for all the children so they can attend classes for the coming four months. 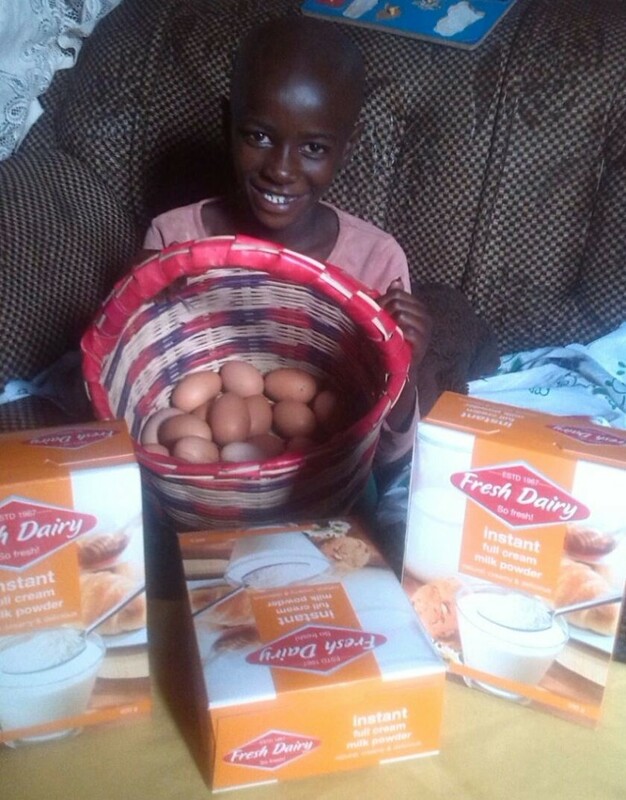 He has also brought Miracle her monthly food package. 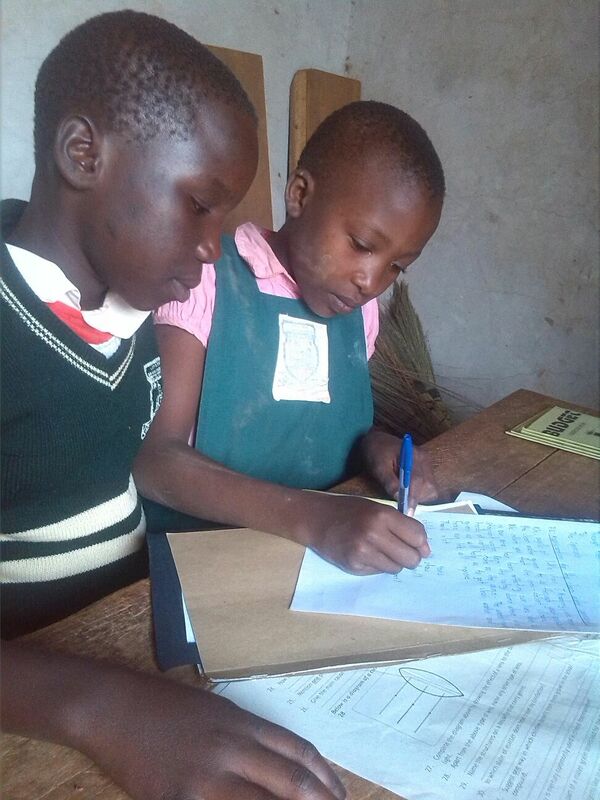 In Uganda the students have received their school reports this week and now they can enjoy a four-week holiday. The children who are in boarding will also go home for a few weeks. 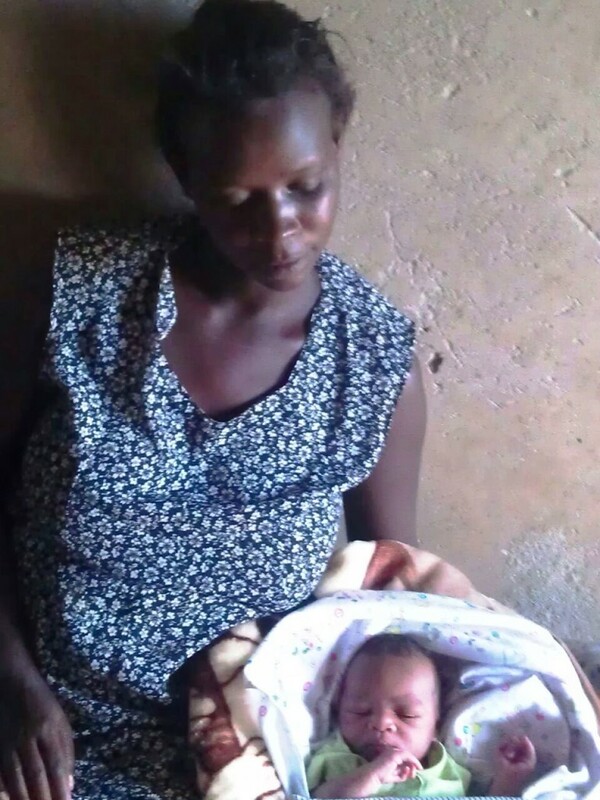 This will be a special period for Brenda, Joanitah and Jireh because their mother was delivered of a healthy son. They will have all the time to get to know their little brother well. 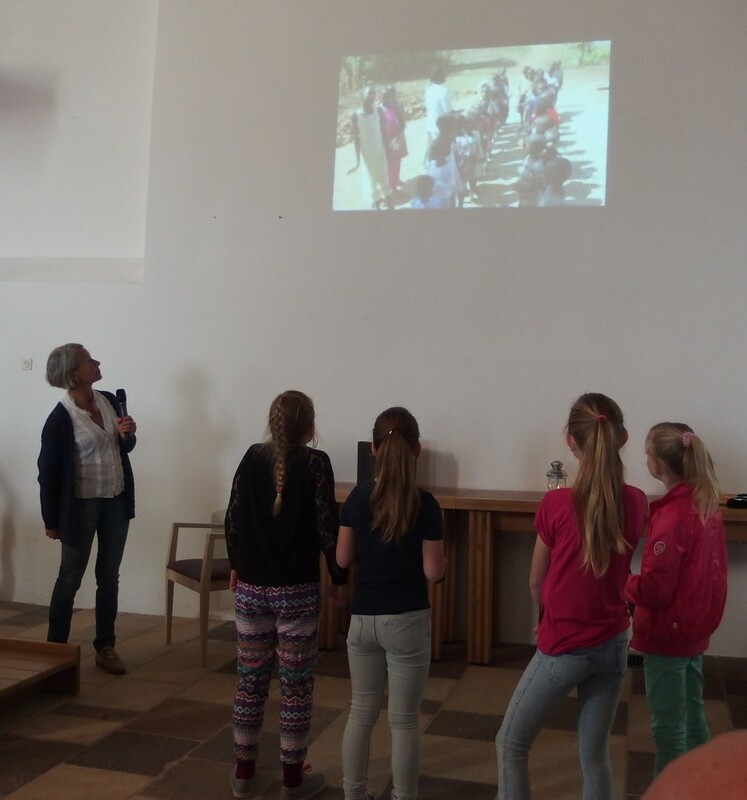 During the church service in Bredevoort Anja told the congregation about her visit to Uganda. She showed some films her husband made of the children in Uganda making the drawings for the children in Bredevoort. After months of draught the rainy season has started. 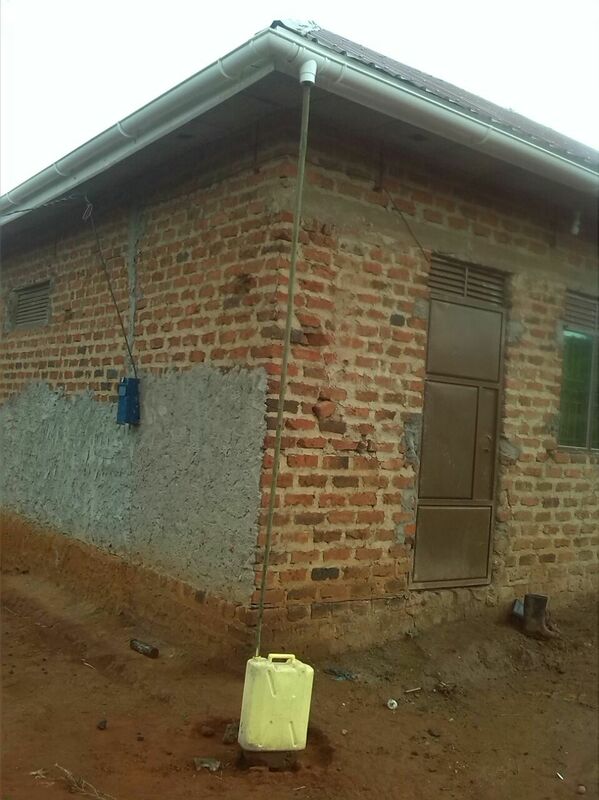 Last year we had gutters installed at Apollo’s house but unfortunately the watertank was not ready yet. This will be done very soon. In the mean time Apollo found a really clever solution! Don’t forget to change the jerrycans on time! A lot of work is being done to rebuild the storeroom in Apollo’s house into ‘Joanne’s Library and Reading Club’. Normally, an average of more than 40 children sit in his living-room and under the awning to read and play. This is not something we want. That’s why the storeroom is being rebuilt so that there is enough room for the bookcases and the children. The Joanne Foundation is a fact. On Monday March 2, 2015 Anja, Elske, Helma and Arent signed the founding act at the office of notary Mr. Brinkman.